The internment of Japanese Americans in the United States during World War II was the forced relocation and incarceration in concentration camps in the western interior of the country of between 110,000 and 120,000 people of Japanese ancestry, most of whom lived on the Pacific coast. Sixty-two percent of the internees were United States citizens. These actions were ordered by President Franklin D. Roosevelt shortly after Imperial Japan's attack on Pearl Harbor. Of 127,000 Japanese Americans living in the continental United States at the time of the Pearl Harbor attack, 112,000 resided on the West Coast. About 80,000 were Nisei (literal translation: "second generation"; American-born Japanese with U.S. citizenship) and Sansei ("third generation"; the children of Nisei). The rest were Issei ("first generation") immigrants born in Japan who were ineligible for U.S. citizenship under U.S. law. Japanese Americans were incarcerated based on local population concentrations and regional politics. More than 110,000 Japanese Americans in the mainland U.S., who mostly lived on the West Coast, were forced into interior camps. However, in Hawaii, where 150,000-plus Japanese Americans composed over one-third of the population, only 1,200 to 1,800 were also interned. The internment is considered to have resulted more from racism than from any security risk posed by Japanese Americans. Those who were as little as 1/16 Japanese, orphaned infants, and anyone with—in the words of the architect behind the internment program, Colonel Karl Bendetsen—"one drop of Japanese blood" were placed in the internment camps. Roosevelt authorized the deportation and incarceration with Executive Order 9066, issued on February 19, 1942, which allowed regional military commanders to designate "military areas" from which "any or all persons may be excluded." This authority was used to declare that all people of Japanese ancestry were excluded from the West Coast, including all of California and parts of Oregon, Washington, and Arizona, except for those in government camps. Approximately 5,000 Japanese Americans relocated outside the exclusion zone before March 1942, while some 5,500 community leaders had been arrested immediately after the Pearl Harbor attack and thus were already in custody. The majority of nearly 130,000 Japanese Americans living in the U.S. mainland were forcibly relocated from their West Coast homes during the spring of 1942. The United States Census Bureau assisted the internment efforts by spying and providing confidential neighborhood information on Japanese Americans. The Bureau denied its role for decades, but it became public in 2007. In 1944, the U.S. Supreme Court upheld the constitutionality of the removal by ruling against Fred Korematsu's appeal for violating an exclusion order. The Court limited its decision to the validity of the exclusion orders, avoiding the issue of the incarceration of U.S. citizens without due process. In 1980, under mounting pressure from the Japanese American Citizens League and redress organizations, President Jimmy Carter opened an investigation to determine whether the decision to put Japanese Americans into concentration camps had been justified by the government. He appointed the Commission on Wartime Relocation and Internment of Civilians (CWRIC) to investigate the camps. The Commission's report, titled Personal Justice Denied, found little evidence of Japanese disloyalty at the time and concluded that the incarceration had been the product of racism. It recommended that the government pay reparations to the internees. In 1988, President Ronald Reagan signed into law the Civil Liberties Act of 1988 which apologized for the internment on behalf of the U.S. government and authorized a payment of $20,000 (equivalent to $42,000 in 2018) to each camp survivor. The legislation admitted that government actions were based on "race prejudice, war hysteria, and a failure of political leadership." The U.S. government eventually disbursed more than $1.6 billion (equivalent to $3,390,000,000 in 2018) in reparations to 82,219 Japanese Americans who had been interned and their heirs. Due in large part to socio-political changes stemming from the Meiji Restoration—and a recession caused by the abrupt opening of Japan's economy to the world market—people began emigrating from the Empire of Japan in 1868 to find work to survive. From 1869 to 1924 approximately 200,000 immigrated to the islands of Hawaii, mostly laborers expecting to work on the islands' sugar plantations. Some 180,000 went to the U.S. mainland, with the majority settling on the West Coast and establishing farms or small businesses. Most arrived before 1908, when the Gentlemen's Agreement between Japan and the United States banned the immigration of unskilled laborers. A loophole allowed the wives of men already in the US to join their husbands. The practice of women marrying by proxy and immigrating to the U.S. resulted in a large increase in the number of "picture brides." As the Japanese-American population continued to grow, European Americans on the West Coast resisted the new group, fearing competition and exaggerating the idea of hordes of Asians keen to take over white-owned farmland and businesses. Groups such as the Asiatic Exclusion League, the California Joint Immigration Committee, and the Native Sons of the Golden West organized in response to this "Yellow Peril." They lobbied successfully to restrict the property and citizenship rights of Japanese immigrants, as similar groups had previously organized against Chinese immigrants. Several laws and treaties attempting to slow immigration from Japan were introduced beginning in the late 19th century. The Immigration Act of 1924, following the example of the 1882 Chinese Exclusion Act, effectively banned all immigration from Japan and other "undesirable" Asian countries. The 1924 ban on immigration produced unusually well-defined generational groups within the Japanese-American community. The Issei were exclusively those who had immigrated before 1924; some desired to return to their homeland. Because no new immigration was permitted, all Japanese Americans born after 1924 were, by definition, born in the U.S. and automatically U.S. citizens. This Nisei generation were a distinct cohort from their parents. In addition to the usual generational differences, Issei men had been typically ten to fifteen years older than their wives, making them significantly older than the younger children of their often large families. 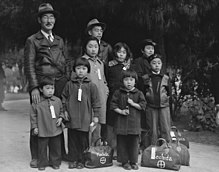 U.S. law prohibited Japanese immigrants from becoming naturalized citizens, making them dependent on their children to rent or purchase property. Communication between English-speaking children and parents who spoke mostly or completely in Japanese was often difficult. A significant number of older Nisei, many of whom were born prior to the immigration ban, had married and already started families of their own by the time the US joined World War II. Despite racist legislation that prevented Issei from becoming naturalized citizens (and therefore from owning property, voting, or running for political office), these Japanese immigrants established communities in their new hometowns. 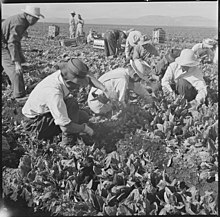 Japanese Americans contributed to the agriculture of California and other Western states, by introducing irrigation methods that enabled the cultivation of fruits, vegetables, and flowers on previously inhospitable land. In both rural and urban areas, kenjinkai, community groups for immigrants from the same Japanese prefecture, and fujinkai, Buddhist women's associations, organized community events and charitable work, provided loans and financial assistance and built Japanese language schools for their children. 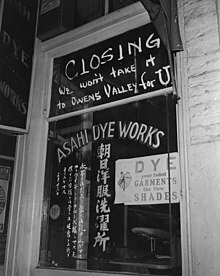 Excluded from setting up shop in white neighborhoods, nikkei-owned small businesses thrived in the Nihonmachi, or Japantowns of urban centers, such as Los Angeles, San Francisco, and Seattle. In the 1930s the Office of Naval Intelligence (ONI), concerned by Imperial Japan's rising military power in Asia, began conducting surveillance on Japanese-American communities in Hawaii. From 1936, at the behest of President Roosevelt, the ONI began compiling a "special list of those who would be the first to be placed in a concentration camp in the event of trouble" between Japan and the United States. In 1939, again by order of the President, the ONI, Military Intelligence Division, and FBI began working together to compile a larger Custodial Detention Index. Early in 1941, Roosevelt commissioned Curtis Munson to conduct an investigation on Japanese Americans living on the West Coast and in Hawaii. After working with FBI and ONI officials and interviewing Japanese Americans and those familiar with them, Munson determined that the "Japanese problem" was nonexistent. His final report to the President, submitted November 7, 1941, "certified a remarkable, even extraordinary degree of loyalty among this generally suspect ethnic group." A subsequent report by Kenneth Ringle, delivered to the President in January 1942, also found little evidence to support claims of Japanese-American disloyalty and argued against mass incarceration. A Japanese American unfurled this banner in Oakland, California the day after the Pearl Harbor attack. This Dorothea Lange photograph was taken in March 1942, just prior to the man's internment. 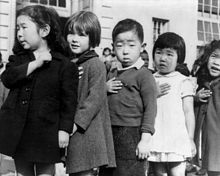 Children at the Weill public school in San Francisco pledge allegiance to the American flag in April 1942, prior to the internment of Japanese Americans. A child is "Tagged for evacuation", Salinas, California, May 1942. Photo by Russell Lee. The attack on Pearl Harbor on December 7, 1941, led military and political leaders to suspect that Imperial Japan was preparing a full-scale attack on the West Coast of the United States. Due to Japan's rapid military conquest of a large portion of Asia and the Pacific including a small portion of the U.S. continent (i.e., Aleutian Islands Campaign) between 1937 and 1942, some Americans feared that its military forces were unstoppable. 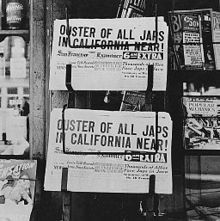 But, six weeks after the attack, public opinion along the Pacific began to turn against Japanese Americans living on the West Coast, as the press and other Americans became nervous about the potential for fifth column activity. Though the administration (including President Franklin D. Roosevelt and FBI Director J. Edgar Hoover) dismissed all rumors of Japanese-American espionage on behalf of the Japanese war effort, pressure mounted upon the administration as the tide of public opinion turned against Japanese Americans. Civilian, law enforcement, and military authorities had serious concerns about the loyalty of the ethnic Japanese after the Niihau incident which immediately followed the attack on Pearl Harbor, when a civilian Japanese national and two Hawaiian-born ethnic Japanese on the island of Ni'ihau violently freed a downed and captured Japanese naval airman, attacking their fellow Ni'ihau islanders in the process. Several concerns over the loyalty of ethnic Japanese seemed to stem from racial prejudice rather than any evidence of malfeasance. The Roberts Commission report, which investigated the Pearl Harbor attack, was released on January 25 and accused persons of Japanese ancestry of espionage leading up to the attack. Although the report's key finding was that General Walter Short and Admiral Husband E. Kimmel had been derelict in their duties during the attack on Pearl Harbor, one passage made vague reference to "Japanese consular agents and other... persons having no open relations with the Japanese foreign service" transmitting information to Japan. It was unlikely that these "spies" were Japanese American, as Japanese intelligence agents were distrustful of their American counterparts and preferred to recruit "white persons and Negroes." However, despite the fact that the report made no mention of Americans of Japanese ancestry, national and West Coast media nevertheless used the report to vilify Japanese Americans and inflame public opinion against them. The fact that nothing has happened so far is more or less . . . ominous, in that I feel that in view of the fact that we have had no sporadic attempts at sabotage that there is a control being exercised and when we have it it will be on a mass basis. There's a tremendous volume of public opinion now developing against the Japanese of all classes, that is aliens and non-aliens, to get them off the land, and in Southern California around Los Angeles—in that area too—they want and they are bringing pressure on the government to move all the Japanese out. As a matter of fact, it's not being instigated or developed by people who are not thinking but by the best people of California. Since the publication of the Roberts Report they feel that they are living in the midst of a lot of enemies. They don't trust the Japanese, none of them. I don't want any of them [persons of Japanese ancestry] here. They are a dangerous element. There is no way to determine their loyalty... It makes no difference whether he is an American citizen, he is still a Japanese. American citizenship does not necessarily determine loyalty... But we must worry about the Japanese all the time until he is wiped off the map. DeWitt also sought approval to conduct search and seizure operations aimed at preventing alien Japanese from making radio transmissions to Japanese ships. The Justice Department declined, stating that there was no probable cause to support DeWitt's assertion, as the FBI concluded that there was no security threat. On January 2, the Joint Immigration Committee of the California Legislature sent a manifesto to California newspapers which attacked "the ethnic Japanese," who it alleged were "totally unassimilable." This manifesto further argued that all people of Japanese heritage were loyal subjects of the Emperor of Japan; the manifesto contended that Japanese language schools were bastions of racism which advanced doctrines of Japanese racial superiority. The manifesto was backed by the Native Sons and Daughters of the Golden West and the California Department of the American Legion, which in January demanded that all Japanese with dual citizenship be placed in concentration camps. Internment was not limited to those who had been to Japan, but included a very small number of German and Italian enemy aliens. By February, Earl Warren, the Attorney General of California (and a future Chief Justice of the United States), had begun his efforts to persuade the federal government to remove all people of Japanese ethnicity from the West Coast. Those who were as little as 1/16 Japanese could be placed in internment camps. There is evidence supporting the argument that the measures were racially motivated, rather than a military necessity. Bendetsen, promoted to colonel, said in 1942, "I am determined that if they have one drop of Japanese blood in them, they must go to camp." Upon the bombing of Pearl Harbor and pursuant to the Alien Enemies Act, Presidential Proclamations 2525, 2526 and 2527 were issued designating Japanese, German and Italian nationals as enemy aliens. Information from the CDI was used to locate and incarcerate foreign nationals from Japan, Germany and Italy (although Germany and Italy did not declare war on the U.S. until December 11). Presidential Proclamation 2537 was issued on January 14, 1942, requiring aliens to report any change of address, employment, or name to the FBI. Enemy aliens were not allowed to enter restricted areas. Violators of these regulations were subject to "arrest, detention and internment for the duration of the war." On February 13, the Pacific coast Congressional subcommittee on aliens and sabotage recommended to the President immediate evacuation of "all persons of Japanese lineage and all others, aliens and citizens alike" who were thought to be dangerous from "strategic areas," further specifying that these included the entire "strategic area" of California, Oregon, Washington, and Alaska. On February 16 the President tasked Secretary of War Henry L. Stimson with replying. A conference on February 17 of Secretary Stimson with assistant secretary John J. McCloy, Provost Marshal General Allen W. Gullion, Deputy chief of Army Ground Forces Mark W. Clark, and Colonel Bendetsen decided that General DeWitt should be directed to commence evacuations "to the extent he deemed necessary" to protect vital installations. Executive Order 9066, signed by Franklin D. Roosevelt on February 19, 1942, authorized military commanders to designate "military areas" at their discretion, "from which any or all persons may be excluded." These "exclusion zones," unlike the "alien enemy" roundups, were applicable to anyone that an authorized military commander might choose, whether citizen or non-citizen. Eventually such zones would include parts of both the East and West Coasts, totaling about 1/3 of the country by area. Unlike the subsequent deportation and incarceration programs that would come to be applied to large numbers of Japanese Americans, detentions and restrictions directly under this Individual Exclusion Program were placed primarily on individuals of German or Italian ancestry, including American citizens. March 2, 1942: Lieutenant General John L. DeWitt issued Public Proclamation No. 1, declaring that "such person or classes of persons as the situation may require" would, at some later point, be subject to exclusion orders from "Military Area No. 1" (essentially, the entire Pacific coast to about 100.2 miles (161.3 km) inland), and requiring anyone who had "enemy" ancestry to file a Change of Residence Notice if they planned to move. A second exclusion zone was designated several months later which included the areas chosen by most of the Japanese Americans who had managed to leave the first zone. March 11, 1942: Executive Order 9095 created the Office of the Alien Property Custodian, and gave it discretionary, plenary authority over all alien property interests. Many assets were frozen, creating immediate financial difficulty for the affected aliens, preventing most from moving out of the exclusion zones. March 21, 1942: President Roosevelt signed Public Law 503 (approved by voice votes after only an hour of discussion in the Senate and thirty minutes in the House) in order to provide for the enforcement of his executive order. Authored by War Department official Karl Bendetsen—who would later be promoted to Director of the Wartime Civilian Control Administration and oversee the incarceration of Japanese Americans—the law made violations of military orders a misdemeanor punishable by up to $5,000 in fines and one year in prison. March 24, 1942: Public Proclamation No. 3 declares an 8:00 pm to 6:00 am curfew for "all enemy aliens and all persons of Japanese ancestry" within the military areas. A group of young evacuees wave from the window of a special train as it leaves Seattle with Bainbridge Island evacuees, March 30, 1942. March 24, 1942: General DeWitt began to issue Civilian Exclusion Orders for specific areas within "Military Area No. 1." Japanese Americans on Bainbridge Island, Washington were the first in the country to be subject to such an order, due to the island's proximity to naval bases; they were given until March 30 to prepare for removal from the island, an event commemorated by the Bainbridge Island Japanese American Exclusion Memorial. May 3, 1942: General DeWitt issued Civilian Exclusion Order No. 34, ordering all people of Japanese ancestry, whether citizens or non-citizens, who were still living in "Military Area No. 1" to report to assembly centers, where they would live until being moved to permanent "Relocation Centers". These edicts included persons of part-Japanese ancestry as well. Anyone with at least one-sixteenth (equivalent to having one great-great grandparent) Japanese ancestry was eligible. Korean Americans and Taiwanese, classified as ethnically Japanese because both Korea and Taiwan were Japanese colonies at the time, were also included. We're charged with wanting to get rid of the Japs for selfish reasons. We do. It's a question of whether the White man lives on the Pacific Coast or the brown men. They came into this valley to work, and they stayed to take over... If all the Japs were removed tomorrow, we'd never miss them in two weeks because the White farmers can take over and produce everything the Jap grows. And we do not want them back when the war ends, either. I am for the immediate removal of every Japanese on the West Coast to a point deep in the interior. I don't mean a nice part of the interior either. Herd 'em up, pack 'em off, and give 'em the inside room in the badlands... Personally, I hate the Japanese. And that goes for all of them. A viper is nonetheless a viper wherever the egg is hatched... So, a Japanese American born of Japanese parents, nurtured upon Japanese traditions, living in a transplanted Japanese atmosphere...notwithstanding his nominal brand of accidental citizenship almost inevitably and with the rarest exceptions grows up to be a Japanese, and not an American... Thus, while it might cause injustice to a few to treat them all as potential enemies, I cannot escape the conclusion...that such treatment...should be accorded to each and all of them while we are at war with their race. State politicians joined the bandwagon that was embraced by Leland Ford of Los Angeles, who demanded that "all Japanese, whether citizens or not, be placed in [inland] concentration camps." 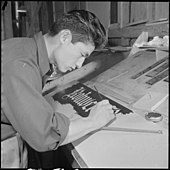 Incarceration of Japanese Americans, who provided critical agricultural labor on the West Coast, created a labor shortage which was exacerbated by the induction of many American laborers into the Armed Forces. This vacuum precipitated a mass immigration of Mexican workers into the United States to fill these jobs, under the banner of what became known as the Bracero Program. Many Japanese internees were temporarily released from their camps – for instance, to harvest Western beet crops – to address this wartime labor shortage. Like many White American farmers, the White businessmen of Hawaii had their own motives for determining how to deal with the Japanese Americans, but they opposed internment. Instead, these individuals gained passage of legislation to retain in freedom the nearly 150,000 Japanese Americans who would have been otherwise sent to internment camps within Hawaii. As a result, only 1,200 to 1,800 Japanese Americans in Hawaii were interned. The powerful businessmen of Hawaii concluded that imprisonment of such a large proportion of the islands' population would adversely affect the economic prosperity of the island state. The Japanese represented "over 90 percent of the carpenters, nearly all of the transportation workers, and a significant portion of the agricultural laborers" on the island. General Delos Carleton Emmons, the military governor of Hawaii, also argued that Japanese labor was "'absolutely essential' for rebuilding the defenses destroyed at Pearl Harbor." Recognizing the Japanese-American community's contribution to the affluence of the Hawaiian economy, General Emmons fought against the internment of the Japanese Americans and had the support of most of the businessmen of Hawaii. Coming to different conclusions about how to deal with the Japanese-American community, both the White farmers of the United States and the White businessmen of Hawaii placed priority on protecting their own economic interests. A Challenge to Democracy was a twenty-minute film produced in 1944 by the War Relocation Authority. The Niihau Incident occurred in December 1941, just after the Japanese attack on Pearl Harbor. Three Japanese Americans on the Hawaiian island of Niihau assisted a Japanese pilot, Shigenori Nishikaichi, who crashed there. 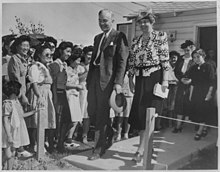 Despite the incident, the Territorial Governor of Hawaii, Joseph Poindexter rejected calls for the mass internment of the Japanese Americans living there. In Magic: The Untold Story of U.S. Intelligence and the Evacuation of Japanese Residents From the West Coast During World War II, David Lowman, a former National Security Agency (NSA) operative, argues that Magic ("Magic" was the code-name for American code-breaking efforts) intercepts posed "frightening specter of massive espionage nets", thus justifying internment. Lowman contended that incarceration served to ensure the secrecy of U.S. code-breaking efforts, because effective prosecution of Japanese Americans might necessitate disclosure of secret information. If U.S. code-breaking technology was revealed in the context of trials of individual spies, the Japanese Imperial Navy would change its codes, thus undermining U.S. strategic wartime advantage. Some scholars have criticized or dismissed Lowman's reasoning that "disloyalty" among some individual Japanese Americans could legitimize "incarcerating 120,000 people, including infants, the elderly, and the mentally ill". Lowman's reading of the contents of the Magic cables has also been challenged, as some scholars contend that the cables demonstrate that Japanese Americans were not heeding the overtures of Imperial Japan to spy against the United States. According to one critic, Lowman's book has long since been "refuted and discredited". The controversial conclusions drawn by Lowman were defended by conservative commentator Michelle Malkin in her book In Defense of Internment; The Case for 'Racial Profiling' in World War II and the War on Terror (2004). Malkin's defense of Japanese internment was due in part to reaction to what she describes as the "constant alarmism from Bush-bashers who argue that every counter-terror measure in America is tantamount to the internment". She criticized academia's treatment of the subject, and suggested that academics critical of Japanese internment had ulterior motives. Her book was widely criticized, particularly with regard to her reading of the "Magic" cables. Daniel Pipes, also drawing on Lowman, has defended Malkin, and said that Japanese American internment was "a good idea" which offers "lessons for today". A letter by General DeWitt and Colonel Bendetsen expressing racist bias against Japanese Americans was circulated and then hastily redacted in 1943–1944. DeWitt's final report stated that, because of their race, it was impossible to determine the loyalty of Japanese Americans, thus necessitating internment. The original version was so offensive – even in the atmosphere of the wartime 1940s – that Bendetsen ordered all copies to be destroyed. In 1980, a copy of the original Final Report: Japanese Evacuation from the West Coast – 1942 was found in the National Archives, along with notes showing the numerous differences between the original and redacted versions. This earlier, racist and inflammatory version, as well as the FBI and Office of Naval Intelligence (ONI) reports, led to the coram nobis retrials which overturned the convictions of Fred Korematsu, Gordon Hirabayashi and Minoru Yasui on all charges related to their refusal to submit to exclusion and internment. The courts found that the government had intentionally withheld these reports and other critical evidence, at trials all the way up to the Supreme Court, which proved that there was no military necessity for the exclusion and internment of Japanese Americans. In the words of Department of Justice officials writing during the war, the justifications were based on "willful historical inaccuracies and intentional falsehoods". In May 2011, U.S. Solicitor General Neal Katyal, after a year of investigation, found Charles Fahy had intentionally withheld The Ringle Report drafted by the Office of Naval Intelligence, in order to justify the Roosevelt administration's actions in the cases of Hirabayashi v. United States and Korematsu v. United States. The report would have undermined the administration's position of the military necessity for such action, as it concluded that most Japanese Americans were not a national security threat, and that allegations of communication espionage had been found to be without basis by the FBI and Federal Communications Commission. Editorials from major newspapers at the time were generally supportive of the internment of the Japanese by the United States. Since Dec. 7 there has existed an obvious menace to the safety of this region in the presence of potential saboteurs and fifth columnists close to oil refineries and storage tanks, airplane factories, Army posts, Navy facilities, ports and communications systems. Under normal sensible procedure not one day would have elapsed after Pearl Harbor before the government had proceeded to round up and send to interior points all Japanese aliens and their immediate descendants for classification and possible internment. The time to stop taking chances with Japanese aliens and Japanese-Americans has come. . . . While Americans have an inate [sic] distaste for stringent measures, every one must realize this is a total war, that there are no Americans running loose in Japan or Germany or Italy and there is absolutely no sense in this country running even the slightest risk of a major disaster from enemy groups within the nation. There is but one way in which to regard the Presidential order empowering the Army to establish "military areas" from which citizens or aliens may be excluded. That is to accept the order as a necessary accompaniment of total defense. As to a considerable number of Japanese, no matter where born, there is unfortunately no doubt whatever. They are for Japan; they will aid Japan in every way possible by espionage, sabotage and other activity; and they need to be restrained for the safety of California and the United States. And since there is no sure test for loyalty to the United States, all must be restrained. Those truly loyal will understand and make no objection. The Japs in these centers in the United States have been afforded the very best of treatment, together with food and living quarters far better than many of them ever knew before, and a minimum amount of restraint. They have been as well fed as the Army and as well as or better housed. . . . The American people can go without milk and butter, but the Japs will be supplied. As a race, the Japanese have made for themselves a record for conscienceless treachery unsurpassed in history. Whatever small theoretical advantages there might be in releasing those under restraint in this country would be enormously outweighed by the risks involved. Hayward, California. "Members of the Mochida family awaiting evacuation bus. Identification tags are used to aid in keeping the family unit intact during all phases of evacuation. Mochida operated a nursery and five greenhouses on a two-acre site in Eden Township. He raised snapdragons and sweet peas." While this event is most commonly called the internment of Japanese Americans, the government operated several different types of camps holding Japanese Americans. The best known facilities were the military-run Wartime Civil Control Administration (WCCA) Assembly Centers and the civilian-run War Relocation Authority (WRA) Relocation Centers, which are generally (but unofficially) referred to as "internment camps". Scholars have urged dropping such euphemisms and refer to them as concentration camps and the people as incarcerated. The Department of Justice (DOJ) operated camps officially called Internment Camps, which were used to detain those suspected of crimes or of "enemy sympathies". The government also operated camps for a limited number of German Americans and Italian Americans, who sometimes were assigned to share facilities with the Japanese Americans. The WCCA and WRA facilities were the largest and the most public. The WCCA Assembly Centers were temporary facilities that were first set up in horse racing tracks, fairgrounds, and other large public meeting places to assemble and organize internees before they were transported to WRA Relocation Centers by truck, bus, or train. The WRA Relocation Centers were semi-permanent camps that housed persons removed from the exclusion zone after March 1942, or until they were able to relocate elsewhere in the United States outside the exclusion zone. Eight U.S. Department of Justice Camps (in Texas, Idaho, North Dakota, New Mexico, and Montana) held Japanese Americans, primarily non-citizens and their families. The camps were run by the Immigration and Naturalization Service, under the umbrella of the DOJ, and guarded by Border Patrol agents rather than military police. The population of these camps included approximately 3,800 of the 5,500 Buddhist and Christian ministers, school instructors, newspaper workers, fishermen, and community leaders who had been accused of fifth column activity and arrested by the FBI after Pearl Harbor. (The remaining 1,700 were released to WRA relocation centers.) Immigrants and nationals of German and Italian ancestry were also held in these facilities, often in the same camps as Japanese Americans. Approximately 7,000 German Americans and 3,000 Italian Americans from Hawai'i and the U.S. mainland were interned in DOJ camps, along with 500 German seamen already in custody after being rescued from the SS Columbus in 1939. In addition 2,264 ethnic Japanese, 4,058 ethnic Germans, and 288 ethnic Italians were deported from 19 Latin American countries for a later-abandoned hostage exchange program with Axis countries or confinement in DOJ camps. Several U.S. Army internment camps held Japanese, Italian, and German American men considered "potentially dangerous". Camp Lordsburg, in New Mexico, was the only site built specifically to confine Japanese Americans. In May 1943, the Army was given responsibility for the detention of prisoners of war and all civilian internees were transferred to DOJ camps. This Dorothea Lange photo (May 8, 1942) was captioned: "Hayward, California. Friends say good-bye as a family of Japanese ancestry await evacuation bus. Baggage of evacuees, mostly from small farms in Alameda County, was piled on sidewalk. Evacuees will be housed in War Relocation Authority centers for the duration." Executive Order 9066 authorized the removal of all persons of Japanese ancestry from the West Coast; however, it was signed before there were any facilities completed to house the displaced Japanese Americans. After the voluntary evacuation program failed to result in many families leaving the exclusion zone, the military took charge of the now-mandatory evacuation. On April 9, 1942, the Wartime Civilian Control Administration (WCCA) was established by the Western Defense Command to coordinate the forced removal of Japanese Americans to inland concentration camps. The relocation centers faced opposition from inland communities near the proposed sites who disliked the idea of their new "Jap" neighbors. In addition, government forces were struggling to build what would essentially be self-sufficient towns in very isolated, undeveloped, and harsh regions of the country; they were not prepared to house the influx of over 110,000 evacuees. Since Japanese Americans living in the restricted zone were considered too dangerous to conduct their daily business, the military decided it had to house them in temporary centers until the relocation centers were completed. Under the direction of Colonel Karl Bendetsen, existing facilities had been designated for conversion to WCCA use in March 1942, and the Army Corps of Engineers finished construction on these sites on April 21, 1942. All but four of the 15 confinement sites (12 in California, and one each in Washington, Oregon, and Arizona) had previously been racetracks or fairgrounds. The stables and livestock areas were cleaned out and hastily converted to living quarters for families of up to six, while wood and tarpaper barracks were constructed for additional housing, as well as communal latrines, laundry facilities, and mess halls. A total of 92,193 Japanese Americans were transferred to these temporary detention centers from March to August 1942. (18,026 more had been taken directly to two "reception centers" that were developed as the Manzanar and Poston WRA camps.) The WCCA was dissolved on March 15, 1943, when it became the War Relocation Authority and turned its attentions to the more permanent relocation centers. The War Relocation Authority (WRA) was the U.S. civilian agency responsible for the relocation and detention. The WRA was created by President Roosevelt on March 18, 1942, with Executive Order 9102 and officially ceased to exist June 30, 1946. Milton S. Eisenhower, then an official of the Department of Agriculture, was chosen to head the WRA. In the 1943 US Government film Japanese Relocation he said, "This picture tells how the mass migration was accomplished. Neither the Army, not the War Relocation Authority relish the idea of taking men, women and children from their homes, their shops and their farms. So, the military and civilian agencies alike, determined to do the job as a democracy should—with real consideration for the people involved." Dillon S. Myer replaced Eisenhower three months later on June 17, 1942. Myer served as Director of the WRA until the centers were closed. Within nine months, the WRA had opened ten facilities in seven states, and transferred over 100,000 people from the WCCA facilities. The WRA camp at Tule Lake, though initially like the other camps, eventually was used as a detention center for people believed to pose a security risk. Tule Lake also served as a "segregation center" for individuals and families who were deemed "disloyal", and for those who were to be deported to Japan. There were three types of camps. Civilian Assembly Centers were temporary camps, frequently located at horse tracks, where Japanese Americans were sent as they were removed from their communities. Eventually, most were sent to Relocation Centers, also known as internment camps. Detention camps housed Nikkei considered to be disruptive or of special interest to the government. The Citizen Isolation Centers were for those considered to be problem inmates. Somewhere between 110,000 and 120,000 people of Japanese ancestry were subject to this mass exclusion program, of whom about 80,000 Nisei (second generation) and Sansei (third generation) were U.S. citizens. The rest were Issei (first generation) who were subject to internment under the Alien Enemies Act; many of these "resident aliens" had been inhabitants of the United States for decades, but had been deprived by law of being able to become naturalized citizens. Also part of the West Coast removal were 101 children of Japanese descent taken from orphanages and foster homes within the exclusion zone. Internees of Japanese descent were first sent to one of 17 temporary "Civilian Assembly Centers", where most awaited transfer to more permanent relocation centers being constructed by the newly formed War Relocation Authority (WRA). Some of those who reported to the civilian assembly centers were not sent to relocation centers, but were released under the condition that they remain outside the prohibited zone until the military orders were modified or lifted. Almost 120,000 Japanese Americans and resident Japanese aliens were eventually removed from their homes in California, the western halves of Oregon and Washington and southern Arizona as part of the single largest forced relocation in U.S. history. Most of these camps/residences, gardens, and stock areas were placed on Native American reservations, for which the Native Americans were formally compensated. The Native American councils disputed the amounts negotiated in absentia by US government authorities. They later sued to gain relief and additional compensation for some items of dispute. Under the National Student Council Relocation Program (supported primarily by the American Friends Service Committee), students of college age were permitted to leave the camps to attend institutions willing to accept students of Japanese ancestry. Although the program initially granted leave permits to a very small number of students, this eventually included 2,263 students by December 31, 1943. On March 2, 1942, General John DeWitt, commanding general of the Western Defense Command, publicly announced the creation of two military restricted zones. Military Area No. 1 consisted of the southern half of Arizona and the western half of California, Oregon, and Washington, as well as all of California south of Los Angeles. Military Area No. 2 covered the rest of those states. DeWitt's proclamation informed Japanese Americans they would be required to leave Military Area 1, but stated that they could remain in the second restricted zone. Removal from Military Area No. 1 initially occurred through "voluntary evacuation". Japanese Americans were free to go anywhere outside of the exclusion zone or inside Area 2, with arrangements and costs of relocation to be borne by the individuals. The policy was short-lived; DeWitt issued another proclamation on March 27 that prohibited Japanese Americans from leaving Area 1. A night-time curfew, also initiated on March 27, 1942, placed further restrictions on the movements and daily lives of Japanese Americans. Eviction from the West Coast began on March 24, 1942, with Civilian Exclusion Order No. 1, which gave the 227 Japanese American residents of Bainbridge Island, Washington six days to prepare for their "evacuation" directly to Manzanar. Colorado governor Ralph Lawrence Carr was the only elected official to publicly denounce the internment of American citizens (an act that cost his reelection, but gained him the gratitude of the Japanese American community, such that a statue of him was erected in the Denver Japantown's Sakura Square). A total of 108 exclusion orders issued by the Western Defense Command over the next five months completed the removal of Japanese Americans from the West Coast in August 1942. In 1943, Secretary of the Interior Harold L. Ickes wrote "the situation in at least some of the Japanese internment camps is bad and is becoming worse rapidly." The quality of life in the camps was heavily influenced by which government entity was responsible for them. INS Camps were regulated by international treaty. The legal difference between interned and relocated had significant effects on those locked up. INS camps were required to provide food quality and housing at the minimum equal to that experienced by the lowest ranked person in the military. According to a 1943 War Relocation Authority report, internees were housed in "tar paper-covered barracks of simple frame construction without plumbing or cooking facilities of any kind". The spartan facilities met international laws, but left much to be desired. Many camps were built quickly by civilian contractors during the summer of 1942 based on designs for military barracks, making the buildings poorly equipped for cramped family living. Throughout many camps, twenty-five people were forced to live in space built to contain four, leaving no room for privacy. Armed guards were posted at the camps, which were all in remote, desolate areas far from population centers. Internees were typically allowed to stay with their families, and were treated decently unless they violated the rules. There are documented instances of guards shooting internees who reportedly attempted to walk outside the fences. One such shooting, that of James Wakasa at Topaz, led to a re-evaluation of the security measures in the camps. Some camp administrations eventually allowed relatively free movement outside the marked boundaries of the camps. Nearly a quarter of the internees left the camps to live and work elsewhere in the United States, outside the exclusion zone. Eventually, some were authorized to return to their hometowns in the exclusion zone under supervision of a sponsoring American family or agency whose loyalty had been assured. The phrase "shikata ga nai" (loosely translated as "it cannot be helped") was commonly used to summarize the interned families' resignation to their helplessness throughout these conditions. This was noticed by their children, as mentioned in the well-known memoir Farewell to Manzanar by Jeanne Wakatsuki Houston and James D. Houston. Further, it is noted that parents may have internalized these emotions to withhold their disappointment and anguish from affecting their children. Nevertheless, children still were cognizant of this emotional repression. Before the war, 87 physicians and surgeons, 137 nurses, 105 dentists, 132 pharmacists, 35 optometrists, and 92 lab technicians provided healthcare to the Japanese American population, with most practicing in urban centers like Los Angeles, San Francisco, and Seattle. As the eviction from the West Coast was carried out, the Wartime Civilian Control Administration worked with the United States Public Health Service (USPHS) and many of these professionals to establish infirmaries within the temporary assembly centers. An Issei doctor was appointed to manage each facility, and additional healthcare staff worked under his supervision, although the USPHS recommendation of one physician for every 1,000 inmates and one nurse to 200 inmates was not met. 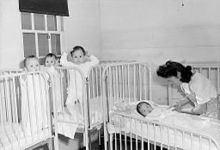 Overcrowded and unsanitary conditions forced assembly center infirmaries to prioritize inoculations over general care, obstetrics, and surgeries; at Manzanar, for example, hospital staff performed over 40,000 immunizations against typhoid and smallpox. [clarification needed] Food poisoning was common and also demanded significant attention. Those who were interned in Topaz, Minidoka, and Jerome experienced outbreaks of dysentery. Facilities in the more permanent "relocation centers" eventually surpassed the makeshift assembly center infirmaries, but in many cases these hospitals were incomplete when inmates began to arrive and were not fully functional for several months. Additionally, vital medical supplies such as medications and surgical and sterilization equipment were limited. The staff shortages suffered in the assembly centers continued in the WRA camps. The administration's decision to invert the management structure and demote Japanese American medical workers to positions below white employees, while capping their pay rate at a $20/month, further exacerbated this problem. (At Heart Mountain, for example, Japanese American doctors received $19/month compared to white nurses' $150/month.) The war had caused a shortage of healthcare professionals across the country, and the camps often lost potential recruits to outside hospitals that offered better pay and living conditions. When the WRA began to allow some Japanese Americans to leave camp, many Nikkei medical professionals resettled outside camp. Those who remained had little authority in administration of the hospitals. Combined with the inequitable payment of salaries between white and Japanese American employees, conflicts arose at several hospitals, and there were two Japanese American walk-outs at Heart Mountain in 1943. Despite a shortage of healthcare workers, limited access to equipment, and tension between white administrators and Japanese American staff, these hospitals provided much needed medical care in camp. The extreme climates of the remote incarceration sites were hard on infants and elderly inmates. The frequent dust storms of the high desert locations led to increased cases of asthma and coccidioidomycosis, while the swampy, mosquito-infested Arkansas camps exposed residents to malaria, all of which were treated in camp. Almost 6,000 live deliveries were performed in these hospitals, and all mothers received pre- and postnatal care. The WRA recorded 1,862 deaths across the ten camps, with cancer, heart disease, tuberculosis, and vascular disease accounting for the majority. Of the 110,000 Japanese Americans detained by the United States government during World War II, 30,000 were children. Most were school-age children, so educational facilities were set up in the camps. Allowing them to continue their education, however, did not erase the potential for traumatic experiences during their overall time in the camps. The government had not adequately planned for the camps, and no real budget or plan was set aside for the new camp educational facilities. Camp schoolhouses were crowded and had insufficient materials, books, notebooks, and desks for students. Not only that the education/instruction was all in English, the schools in Japanese Internment Camps also didn't have any books or supplies to go on as they opened. The state decided to issue a few books only a month after the opening. Wood stoves were used to heat the buildings, and instead of using separate rooms for different kinds of activities only partitions were used to accomplish that. Japanese Internment Camps also did not have any libraries (and consequently no library books), writing arm chairs or desks, and no science equipment. These 'schoolhouses' were essentially prison blocks that contained few windows. In the Southwest, when temperatures rose and the schoolhouse filled, the rooms would be sweltering and unbearable. Class sizes were immense. At the height of its attendance, the Rohwer Camp of Arkansas reached 2,339, with only 45 certified teachers. The student to teacher ratio in the camps was 48:1 in elementary schools and 35:1 for secondary schools, compared to the national average of 28:1. This was due to a few things. One of them was that there was a general teacher shortage in the US at the moment, and the fact that the teachers were required to live in those poor conditions in the camps themselves. "There was persistent mud or dust, heat, mosquitoes, poor food and living conditions, inadequate instructional supplies, and a half mile or more walk each day just to and from the school block". Despite the triple salary increase in the internment camps, they were still unable to fill in all the needed teacher positions with certified personnel, and so in the end they had to hire non-certified teacher detainees to help out the teachers as assistants. The rhetorical curriculum of the schools was based mostly on the study of "the democratic ideal and to discover its many implications". English compositions researched at the Jerome and Rohwer camps in Arkansas focused on these 'American ideals', and many of the compositions pertained to the camps. Responses were varied, as schoolchildren of the Topaz camp were patriotic and believed in the war effort, but could not ignore the fact of their incarceration. To build patriotism, the Japanese language was banned in the camps, forcing the children to learn English and then go home and teach their parents. A baseball game at Manzanar. Picture by Ansel Adams c. 1943. Although life in the camps was very difficult, Japanese Americans formed many different sports teams, including baseball and football teams. In January 1942, President Franklin D. Roosevelt issued what came to be known as the "Green Light Letter", to MLB Commissioner Kenesaw Mountain Landis, which urged him to continue playing Major League Baseball games despite the ongoing war. In it Roosevelt said that "baseball provides a recreation", and this was true for Japanese American incarcerees as well. Over 100 baseball teams were formed in the Manzanar camp so that Japanese Americans could have some recreation, and some of the team names were carry-overs from teams formed before the incarceration. Both men and women participated in the sports. In some cases, the Japanese American baseball teams from the camps traveled to outside communities to play other teams. Incarcerees from Idaho competed in the state tournament in 1943, and there were games between the prison guards and the Japanese American teams. Branch Rickey, who would be responsible for bringing Jackie Robinson into Major League Baseball in 1947, sent a letter to all of the WRA camps expressing interest in scouting some of the Nisei players. In the fall of 1943, three players tried out for the Brooklyn Dodgers in front of MLB scout George Sisler, however, none of them made the team. Although most Nisei college students followed their families into camp, a small number tried to arrange for transfers to schools outside the exclusion zone in order to continue their education. Their initial efforts expanded as sympathetic college administrators and the American Friends Service Committee began to coordinate a larger student relocation program. The Friends petitioned WRA Director Milton Eisenhower to place college students in Eastern and Midwestern academic institutions. 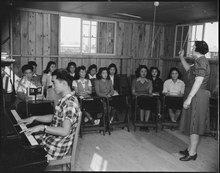 The National Japanese American Student Relocation Council was formed on May 29, 1942, and the AFSC administered the program. By September 1942, after the initial roundup of Japanese Americans, 250 students from assembly centers and WRA camps were back at school. Their tuition, book costs, and living expenses were absorbed by the U.S. government, private foundations, and church scholarships, in addition to significant fundraising efforts led by Issei parents in camp. Outside camp, the students took on the role of "ambassadors of good will", and the NJASRC and WRA promoted this image to soften anti-Japanese prejudice and prepare the public for the resettlement of Japanese Americans in their communities. At Earlham College, President William Dennis helped institute a program that enrolled several dozen Japanese-American students in order to spare them from incarceration. While this action was controversial in Richmond, Indiana, it helped strengthen the college's ties to Japan and the Japanese-American community. At Oberlin College, about 40 evacuated Nisei students were enrolled. One of them, Kenji Okuda, was elected as student council president. In total, over 600 institutions east of the exclusion zone opened their doors to more than 4,000 college-age youth who had been placed behind barbed wire, many of whom were enrolled in West Coast schools prior to their removal. The NJASRC ceased operations on June 7, 1946. Question 28: Will you swear unqualified allegiances to the United States of America and faithfully defend the United States from any and all attack by foreign or domestic forces, and forswear any form of allegiance or obedience to the Japanese emperor, or other foreign government, power or organization? Across the camps, persons who answered No to both questions became known as "No Nos". While most camp inmates simply answered "yes" to both questions, several thousand — 17 percent of the total respondents, 20 percent of the Nisei — gave negative or qualified replies out of confusion, fear or anger at the wording and implications of the questionnaire. In regard to Question 27, many worried that expressing a willingness to serve would be equated with volunteering for combat, while others felt insulted at being asked to risk their lives for a country that had imprisoned them and their families. An affirmative answer to Question 28 brought up other issues. Some believed that renouncing their loyalty to Japan would suggest that they had at some point been loyal to Japan and disloyal to the United States. Many believed they were to be deported to Japan no matter how they answered; they feared an explicit disavowal of the Emperor would become known and make such resettlement extremely difficult. On July 15, 1943, Tule Lake, the site with the highest number of "no" responses to the questionnaire, was designated to house inmates whose answers suggested they were "disloyal". During the remainder of 1943 and into early 1944, more than 12,000 men, women and children were transferred from other camps to the maximum-security Tule Lake Segregation Center. After these insults, the government passed the Renunciation Act of 1944, a law that made it possible for Nisei and Kibei to renounce their American citizenship. A total of 5,589 internees opted to do so; 5,461 of these were sent to Tule Lake. Of those who renounced US citizenship, 1,327 were repatriated to Japan. Those persons who stayed in the US faced discrimination from the Japanese-American community, both during and after the war, for having made that choice of renunciation. At the time, they feared what their futures held were they to remain American, and remain interned. Minoru Kiyota, who was among those who renounced his citizenship and soon came to regret the decision, has said that he wanted only "to express my fury toward the government of the United States", for his internment and for the mental and physical duress, as well as the intimidation, he was made to face. [M]y renunciation had been an expression of momentary emotional defiance in reaction to years of persecution suffered by myself and other Japanese Americans and, in particular, to the degrading interrogation by the FBI agent at Topaz and being terrorized by the guards and gangs at Tule Lake. Civil rights attorney Wayne M. Collins successfully challenged most of these renunciations as invalid, owing to the conditions of duress and intimidation under which the government obtained them. Many of the deportees were Issei (first generation) or Kibei, who often had difficulty with English and often did not understand the questions they were asked. Even among those Issei who had a clear understanding, Question 28 posed an awkward dilemma: Japanese immigrants were denied U.S. citizenship at the time, so when asked to renounce their Japanese citizenship, answering "Yes" would have made them stateless persons. When the government began seeking army volunteers from among the camps, only 6% of military-aged male inmates volunteered to serve in the U.S. Armed Forces. Most of those who refused tempered that refusal with statements of willingness to fight if they were restored their rights as American citizens. Eventually 20,000 Japanese-American men and many Japanese-American women served in the U.S. Army during World War II. The 442nd Regimental Combat Team, which was composed primarily of Japanese Americans, served with uncommon distinction in the European Theatre of World War II. Many of the U.S. soldiers serving in the unit had families who were held in concentration camps in the United States while they fought abroad. The 442nd Regimental Combat Team, which fought in Europe, was formed from those Japanese Americans who agreed to serve. This unit is the most highly decorated U.S. military unit of its size and duration in U.S. military history. The 442nd's Nisei segregated field artillery battalion, then on detached service within the U.S. Army in Bavaria, liberated at least one of the satellite labor camps of the Nazis' original Dachau concentration camp on April 29, 1945, and only days later, on May 2, halted a death march in southern Bavaria. Many Nisei worked to prove themselves as loyal American citizens. Of the 20,000 Japanese Americans who served in the Army during World War II, "many Japanese-American soldiers had gone to war to fight racism at home" and they were "proving with their blood, their limbs, and their bodies that they were truly American". Some one hundred Nisei women volunteered for the WAC (Women's Army Corps), where, after undergoing rigorous basic training, they had assignments as typists, clerks, and drivers. A smaller number of women also volunteered to serve as nurses for the ANC (Army Nurse Corps). Satoshi Ito, an internment camp internee, reinforces the idea of the immigrants' children striving to demonstrate their patriotism to the United States. He notes that his mother would tell him, "'you're here in the United States, you need to do well in school, you need to prepare yourself to get a good job when you get out into the larger society'". He said she would tell him, "'don't be a dumb farmer like me, like us'" to encourage Ito to successfully assimilate into American society. As a result, he worked exceptionally hard to excel in school and later became a professor at the College of William & Mary. His story, along with the countless Japanese Americans willing to risk their lives in war, demonstrate the lengths many in their community went to prove their American patriotism. As early as 1939, when war broke out in Europe and while armed conflict began to rage in East Asia, the FBI and branches of the Department of Justice and the armed forces began to collect information and surveil influential members of the Japanese community in the United States. These data were included in the Custodial Detention index (CDI). Agents in the Department of Justice's Special Defense Unit classified the subjects into three groups: A, B, and C, with A being "most dangerous", and C being "possibly dangerous". After the Pearl Harbor attack, Roosevelt authorized his attorney general to put into motion a plan for the arrest of individuals on the potential enemy alien lists. Armed with a blanket arrest warrant, the FBI seized these men on the eve of December 8, 1941. These men were held in municipal jails and prisons until they were moved to Department of Justice detention camps, separate from those of the Wartime Relocation Authority (WRA). These camps operated under far more stringent conditions and were subject to heightened criminal-style guards, despite the absence of criminal proceedings. Crystal City, Texas, was one such camp where Japanese Americans, German Americans, Italian Americans, and a large number of U.S.-seized, Axis-descended nationals from several Latin-American countries were interned. 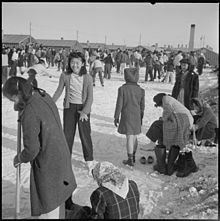 The Canadian government also confined citizens with Japanese ancestry during World War II (see Japanese Canadian internment), for much the same reasons of fear and prejudice. Some Latin American countries of the Pacific Coast, such as Peru, interned ethnic Japanese or sent them to the United States for internment. Brazil also restricted its Japanese Brazilian population. Although Japanese Americans in Hawaii comprised more than one third of the population, businessmen resisted their being interned or deported to mainland concentration camps, as they recognized their contributions to the economy. In the hysteria of the time, some mainland Congressmen (Hawaii was only an incorporated U.S. territory at the time, and despite being fully part of the U.S., did not have a voting representative or senator in Congress) promoted that all Japanese Americans and Japanese immigrants should be removed from Hawaii but were unsuccessful. An estimated 1,200 to 1,800 Japanese nationals and American-born Japanese from Hawaii were interned, either in five camps on the islands or in one of the mainland internment camps, but this represented well-under two percent of the total Japanese American residents in the islands. "No serious explanations were offered as to why ... the internment of individuals of Japanese descent was necessary on the mainland, but not in Hawaii, where the large Japanese-Hawaiian population went largely unmolested." The vast majority of Japanese Americans and their immigrant parents in Hawaii were not interned because the government had already declared martial law in Hawaii and this allowed it to significantly reduce the supposed risk of espionage and sabotage by residents of Japanese ancestry. Also, Japanese Americans comprised over 35% of the territory's population, with 157,905 of Hawaii's 423,330 inhabitants at the time of the 1940 census, making them the largest ethnic group at that time; detaining so many people would have been enormously challenging in terms of logistics. Additionally, the whole of Hawaiian society was dependent on their productivity. According to intelligence reports at the time, "the Japanese, through a concentration of effort in select industries, had achieved a virtual stranglehold on several key sectors of the economy in Hawaii," and they "had access to virtually all jobs in the economy, including high-status, high-paying jobs (e.g., professional and managerial jobs)". To imprison such a large percentage of the islands' work force would have crippled the Hawaiian economy. 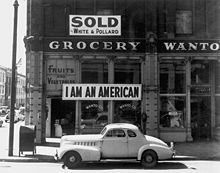 Thus, the unfounded fear of Japanese Americans turning against the United States was overcome by the reality-based fear of massive economic loss. Lieutenant General Delos C. Emmons, commander of the Hawaii Department, promised the local Japanese-American community that they would be treated fairly so long as they remained loyal to the United States. He succeeded in blocking efforts to relocate them to the outer islands or mainland by pointing out the logistical difficulties. Among the small number interned were community leaders and prominent politicians, including territorial legislators Thomas Sakakihara and Sanji Abe. A total of five internment camps operated in the territory of Hawaii, referred to as the "Hawaiian Island Detention Camps". One camp was located at Sand Island at the mouth of Honolulu Harbor. This camp was prepared in advance of the war's outbreak. All prisoners held here were "detained under military custody... because of the imposition of martial law throughout the Islands". Another Hawaiian camp was the Honouliuli Internment Camp, near Ewa, on the southwestern shore of Oahu; it was opened in 1943 to replace the Sand Island camp. Another was located on the island of Maui in the town of Haiku, in addition to the Kilauea Detention Center on Hawaii and Camp Kalaheo on Kauai. During World War II, over 2,200 Japanese from Latin America were held in internment camps run by the Immigration and Naturalization Service, part of the Department of Justice. Beginning in 1942, Latin Americans of Japanese ancestry were rounded up and transported to American internment camps run by the INS and the U.S. Justice Department. The majority of these internees, approximately 1,800, came from Peru. An additional 250 were from Panama, Bolivia, Colombia, Costa Rica, Cuba, Ecuador, El Salvador, Mexico, Nicaragua, and Venezuela. The first group of Japanese Latin Americans arrived in San Francisco on April 20, 1942, on board the Etolin along with 360 ethnic Germans and 14 ethnic Italians from Peru, Ecuador, and Colombia. The 151 men — ten from Ecuador, the rest from Peru — had volunteered for deportation believing they were to be repatriated to Japan. They were denied visas by U.S. Immigration authorities and then detained on the grounds they had tried to enter the country illegally, without a visa or passport. Subsequent transports brought additional "volunteers", including the wives and children of men who had been deported earlier. A total of 2,264 Japanese Latin Americans, about two-thirds of them from Peru, were interned in facilities on the U.S. mainland during the war. The United States originally intended to trade these Latin American internees as part of a hostage exchange program with Japan and other Axis nations. A thorough examination of the documents shows at least one trade occurred. Over 1,300 persons of Japanese ancestry were exchanged for a like number of non-official Americans in October 1943, at the port of Marmagao, India. Over half were Japanese Latin Americans (the rest being ethnic Germans and Italians) and of that number one-third were Japanese Peruvians. On September 2, 1943, the Swedish ship MS Gripsholm departed the U.S. with just over 1,300 Japanese nationals (including nearly a hundred from Canada and Mexico) en route for the exchange location, Marmagao, the main port of the Portuguese colony of Goa on the west coast of India. After two more stops in South America to take on additional Japanese nationals, the passenger manifest reached 1,340. Of that number, Latin American Japanese numbered 55 percent of the Gripsholm's travelers, 30 percent of whom were Japanese Peruvian. Arriving in Marmagao on October 16, 1943, the Gripsholm's passengers disembarked and then boarded the Japanese ship Teia Maru. In return, "non-official" Americans (secretaries, butlers, cooks, embassy staff workers, etc.) previously held by the Japanese Army boarded the Gripsholm while the Teia Maru headed for Tokyo. Because this exchange was done with those of Japanese ancestry officially described as "volunteering" to return to Japan, no legal challenges were encountered. The U.S. Department of State was pleased with the first trade and immediately began to arrange a second exchange of non-officials for February 1944. This exchange would involve 1,500 non-volunteer Japanese who were to be exchanged for 1,500 Americans. The US was busy with Pacific Naval activity and future trading plans stalled. Further slowing the program were legal and political "turf" battles between the State Department, the Roosevelt administration, and the DOJ, whose officials were not convinced of the legality of the program. The completed October 1943 trade took place at the height of the Enemy Alien Deportation Program. 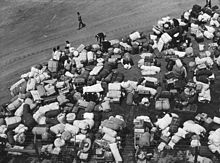 Japanese Peruvians were still being "rounded up" for shipment to the U.S. in previously unseen numbers. Despite logistical challenges facing the floundering prisoner exchange program, deportation plans were moving ahead. This is partly explained by an early-in-the-war revelation of the overall goal for Latin Americans of Japanese ancestry under the Enemy Alien Deportation Program. The goal: that the hemisphere was to be free of Japanese. Secretary of State Cordell Hull wrote an agreeing President Roosevelt, "[that the US must] continue our efforts to remove all the Japanese from these American Republics for internment in the United States." "Native" Peruvians expressed extreme animosity toward their Japanese citizens and expatriates, and Peru refused to accept the post-war return of Japanese Peruvians from the US. Although a small number asserting special circumstances, such as marriage to a non-Japanese Peruvian, did return, the majority were trapped. Their home country refused to take them back (a political stance Peru would maintain until 1950), they were generally Spanish speakers in the Anglo US, and in the postwar U.S., the Department of State started expatriating them to Japan. Civil rights attorney Wayne Collins filed injunctions on behalf of the remaining internees, helping them obtain "parole" relocation to the labor-starved Seabrook Farms in New Jersey. He started a legal battle that would not be resolved until 1953, when, after working as undocumented immigrants for almost ten years, those Japanese Peruvians remaining in the U.S. were finally offered citizenship. On December 18, 1944, the Supreme Court handed down two decisions on the legality of the incarceration under Executive Order 9066. Korematsu v. United States, a 6–3 decision upholding a Nisei's conviction for violating the military exclusion order, stated that, in general, the removal of Japanese Americans from the West Coast was constitutional. However, Ex parte Endo unanimously declared that loyal citizens of the United States, regardless of cultural descent, could not be detained without cause. In effect, the two rulings held that, while the eviction of U.S. citizens in the name of military necessity was legal, the subsequent incarceration was not—thus paving the way for their release. Although WRA Director Dillon Myer and others had pushed for an earlier end to the incarceration, the exclusion order was not rescinded until January 2, 1945 (postponed until after the November 1944 election, so as not to impede Roosevelt's reelection campaign). Many younger internees had already "resettled" in Midwest or Eastern cities to pursue work or educational opportunities. (For example, 20,000 were sent to Lake View in Chicago.) The remaining population began to leave the camps to try to rebuild their lives at home. Former inmates were given $25 and a train ticket to their pre-war places of residence, but many had little or nothing to return to, having lost their homes and businesses. Some emigrated to Japan, although many of these individuals were "repatriated" against their will. The camps remained open for residents who were not ready to return (mostly elderly Issei and families with young children), but the WRA pressured stragglers to leave by gradually eliminating services in camp. Those who had not left by each camp's close date were forcibly removed and sent back to the West Coast. Nine of the ten WRA camps were shut down by the end of 1945, although Tule Lake, which held "renunciants" slated for deportation to Japan, was not closed until March 20, 1946. Japanese Latin Americans brought to the U.S. from Peru and other countries, who were still being held in the DOJ camps at Santa Fe and Crystal City, took legal action in April 1946 in an attempt to avoid deportation to Japan. Following recognition of the injustices done to Japanese Americans, in 1992 Manzanar camp was designated a National Historic Site to "provide for the protection and interpretation of historic, cultural, and natural resources associated with the relocation of Japanese Americans during World War II" (Public Law 102-248). In 2001, the site of the Minidoka War Relocation Center in Idaho was designated the Minidoka National Historic Site. A monument at Manzanar, "to console the souls of the dead"
Boy Scouts at the Granada War Relocation Center raise the flag to half-mast during a memorial service for the first six Nisei soldiers from this Center who were killed in action in Italy. The service was attended by 1,500 Amache internees. August 5, 1944. Many internees lost irreplaceable personal property due to restrictions that prohibited them from taking more than they could carry into the camps. These losses were compounded by theft and destruction of items placed in governmental storage. Leading up to their incarceration, Nikkei were prohibited from leaving the Military Zones or traveling more than 5 miles (8.0 km) from home, forcing those who had to travel for work, like truck farmers and residents of rural towns, to quit their jobs. Many others were simply fired for their "Jap" heritage. Alien land laws in the West Coast states barred the Issei from owning their pre-war homes and farms. Many had cultivated land for decades as tenant farmers, but they lost their rights to farm those lands when they were forced to leave. Other Issei (and Nisei who were renting or had not completed payments on their property) had found families willing to occupy their homes or tend their farms during their incarceration. However, those unable to strike a deal with caretakers had to sell their property, often in a matter of days and at great financial loss to predatory land speculators, who made huge profits. In addition to these monetary and property losses, a number of persons[who?] died or suffered for lack of medical care in camp. Seven were shot and killed by sentries: Kanesaburo Oshima, 58, during an escape attempt from Fort Sill, Oklahoma; Toshio Kobata, 58, and Hirota Isomura, 59, during transfer to Lordsburg, New Mexico; James Ito, 17, and Katsuji James Kanegawa, 21, during the December 1942 Manzanar Riot; James Hatsuaki Wakasa, 65, while walking near the perimeter wire of Topaz; and Shoichi James Okamoto, 30, during a verbal altercation with a sentry at the Tule Lake Segregation Center. Psychological injury was observed by Dillon S. Myer, director of the WRA camps. In June 1945, Myer described how the Japanese Americans had grown increasingly depressed, and overcome with feelings of helplessness and personal insecurity. Author Betty Furuta explains that the Japanese used gaman, loosely meaning "perseverance", to overcome hardships; this was mistaken by non-Japanese as being introverted and lacking initiative. Japanese Americans also encountered hostility and even violence when they returned to the West Coast. Concentrated largely in rural areas of Central California, there were dozens of reports of gun shots, fires, and explosions aimed at Japanese American homes, businesses, and places of worship, in addition to non-violent crimes like vandalism and the defacing of Japanese graves. In one of the few cases to go to trial, four men were accused of attacking the Doi family of Placer County, California, setting off an explosion, and starting a fire on the family's farm in January 1945. Despite a confession from one of the men that implicated the others, the jury accepted their defense attorney's framing of the attack as a justifiable attempt to keep California "a white man's country" and acquitted all four defendants. 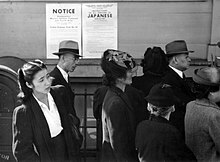 To compensate former internees for their property losses, the US Congress, on July 2, 1948, passed the "American Japanese Claims Act", allowing Japanese Americans to apply for compensation for property losses which occurred as "a reasonable and natural consequence of the evacuation or exclusion". By the time the Act was passed, the IRS had already destroyed most of the internees' 1939–42 tax records. Due to the time pressure and strict limits on how much they could take to the camps, few were able to preserve detailed tax and financial records during the evacuation process. Therefore, it was extremely difficult for claimants to establish that their claims were valid. Under the Act, Japanese American families filed 26,568 claims totaling $148 million in requests; about $37 million was approved and disbursed. The different placement for the interned had significant consequences for their lifetime outcomes. A 2016 study finds, using the random dispersal of internees into camps in seven different states, that the people assigned to richer locations did better in terms of income, education, socioeconomic status, house prices, and housing quality roughly fifty years later. Beginning in the 1960s, a younger generation of Japanese Americans, inspired by the civil rights movement, began what is known as the "Redress Movement", an effort to obtain an official apology and reparations from the federal government for incarcerating their parents and grandparents during the war. They focused not on documented property losses but on the broader injustice and mental suffering caused by the internment. The movement's first success was in 1976, when President Gerald Ford proclaimed that the internment was "wrong", and a "national mistake" which "shall never again be repeated". The campaign for redress was launched by Japanese Americans in 1978. The Japanese American Citizens League (JACL), which had cooperated with the administration during the war, became part of the movement. It asked for three measures: $25,000 to be awarded to each person who was detained, an apology from Congress acknowledging publicly that the U.S. government had been wrong, and the release of funds to set up an educational foundation for the children of Japanese-American families. In 1980, Congress established the Commission on Wartime Relocation and Internment of Civilians (CWRIC) to study the matter. On February 24, 1983, the commission issued a report entitled Personal Justice Denied, condemning the internment as unjust and motivated by racism and xenophobic ideas rather than factual military necessity. Internment camp survivors sued the federal government for $24 million in property loss, but lost the case. However, the Commission recommended that $20,000 in reparations be paid to those Japanese Americans who had suffered internment. The Civil Liberties Act of 1988 exemplified the Japanese American redress movement that impacted the large debate about the reparation bill. There was question over whether the bill would pass during the 1980s due to the poor state of the federal budget and the low support of Japanese Americans covering 1% of the United States. However, four powerful Japanese-American Democrats and Republicans who had war experience, with the support of Democratic congressmen Barney Frank, sponsored the bill and pushed for its passage as their top priority. U.S. President Ronald Reagan signs the Civil Liberties Act of 1988 in August 1988, which granted reparations for the internment of Japanese Americans. 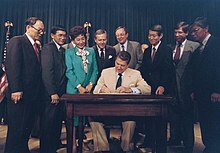 On August 10, 1988, U.S. President Ronald Reagan signed the Civil Liberties Act of 1988, which had been sponsored by Representative Norman Mineta and Senator Alan K. Simpson, who had met while Mineta was interned at Heart Mountain Relocation Center in Wyoming while they were both children. It provided financial redress of $20,000 for each surviving detainee, totaling $1.2 billion. The question of to whom reparations should be given, how much, and even whether monetary reparations were appropriate were subjects of sometimes contentious debate within the Japanese American community and Congress. Over 81,800 people qualified by 1998 and $1.6 billion was distributed among them. 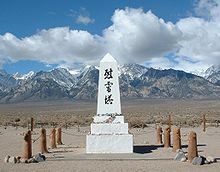 Under the 2001 budget of the United States, Congress authorized that the ten detention sites are to be preserved as historical landmarks: "places like Manzanar, Tule Lake, Heart Mountain, Topaz, Amache, Jerome, and Rohwer will forever stand as reminders that this nation failed in its most sacred duty to protect its citizens against prejudice, greed, and political expediency". 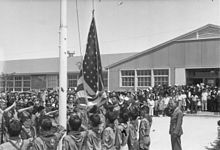 Since the end of World War II, there has been debate over the terminology used to refer to camps in which Americans of Japanese ancestry and their immigrant parents, were incarcerated by the United States Government during the war. These camps have been referred to as "War Relocation Centers", "relocation camps", "relocation centers", "internment camps", and "concentration camps", and the controversy over which term is the most accurate and appropriate continues. A concentration camp is a place where people are imprisoned not because of any crimes they have committed, but simply because of who they are. Although many groups have been singled out for such persecution throughout history, the term 'concentration camp' was first used at the turn of the [20th] century in the Spanish American and Boer Wars. During World War II, America's concentration camps were clearly distinguishable from Nazi Germany's. Nazi camps were places of torture, barbarous medical experiments and summary executions; some were extermination centers with gas chambers. Six million Jews were slaughtered in the Holocaust. Many others, including Gypsies, Poles, homosexuals and political dissidents were also victims of the Nazi concentration camps. In recent years, concentration camps have existed in the former Soviet Union, Cambodia and Bosnia. Despite differences, all had one thing in common: the people in power removed a minority group from the general population and the rest of society let it happen. The New York Times published an unsigned editorial supporting the use of "concentration camp" in the exhibit. An article quoted Jonathan Mark, a columnist for The Jewish Week, who wrote, "Can no one else speak of slavery, gas, trains, camps? It's Jewish malpractice to monopolize pain and minimize victims." AJC Executive Director David A. Harris stated during the controversy, "We have not claimed Jewish exclusivity for the term 'concentration camps.'" On July 7, 2012, at their annual convention, the National Council of the Japanese American Citizens League unanimously ratified the Power of Words Handbook, calling for the use of "...truthful and accurate terms, and retiring the misleading euphemisms created by the government to cover up the denial of Constitutional and human rights, the force, oppressive conditions, and racism against 120,000 innocent people of Japanese ancestry locked up in America's World War II concentration camps." The internment of Japanese Americans has been compared to the persecutions, expulsions, and dislocations of other ethnic minorities during World War II in Europe and Asia. Ralph Lazo, the only known non-spouse, non-Japanese American who voluntarily relocated to an internment camp. When Lazo learned that his Japanese American friends and neighbors were being forcibly removed, he was so outraged that he joined friends on a train that took hundreds to Manzanar. Manzanar officials never asked him about his ancestry. In popular culture Japanese Americans had a big impact in Japanese communities, economy and future. It was so big that impacted the future of the whole country and world in the followed decades. The December 2013 Hawaii Five-0 Episode 81, "Honor thy father", is dedicated to solving a cold case murder at the Honouliuli Internment Camp, some 70 years earlier. John Okada's novel No-No Boy (1956) features a protagonist from Seattle, who was interned with his family and imprisoned for answering "no" to the last two questions on the loyalty questionnaire. It explores the postwar environment in the Pacific Northwest. Both the 1994 novel Snow Falling on Cedars and its 1999 film adaptation refer to the internment of the Imada family in Manzanar. The 2002 novel When the Emperor was Divine by Julie Otsuka tells the story of an unnamed Japanese family incarcerated at the Topaz War Relocation Center in Utah. The novel is based on Otsuka's own family's experiences. Jamie Ford's novel Hotel on the Corner of Bitter and Sweet (2009) tells of a Chinese man's search for an Oscar Holden jazz record bought in his childhood with a Japanese friend in Seattle, and left behind during World War II when she and her family were sent to a Japanese American internment camp. The 2011 novel The Buddha in the Attic by Julie Otsuka, winner of the PEN/Faulkner Award for Fiction, tells the story of Japanese female immigrants in California, and ends on the story of the internment camps and the reaction of neighbors left behind. The 2013 novel Camp Nine by Vivienne Schiffer set in and near the Rohwer Japanese American internment camp in Arkansas. The 2015 historical novel Allegiance by Kermit Roosevelt takes readers inside the US government and Supreme Court to examine the legal and moral debates and the little-known facts surrounding the detention of Japanese Americans. A Harper Lee Prize finalist, the novel is based on a true story. The 2017 novel The Japanese Lover by Isabel Allende presents the lifelong love affair between two immigrants, one of whom is Japanese American, and who is sent along with his whole family to an internment camp. 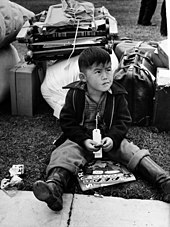 For a more comprehensive list, see List of feature films about the Japanese American internment. In the 1984 movie The Karate Kid, Ralph Macchio's character, Daniel, discovers a box containing references to the death of Mr. Miyagi's wife and child in the Manzanar camp, and to Mr. Miyagi, Pat Morita's character, being awarded the Medal of Honor while serving with the 442nd Infantry Regiment. The 1990 movie Come See The Paradise written and directed by Alan Parker tells the story of an American man who elopes with a Japanese-American woman and their subsequent internment following the outbreak of war. The 2011 film Looking for Jiro by visual studies scholar and performance artist Tina Takemoto explores queerness and homosexual desire in internment camps, focusing on Jiro Onuma, a gay bachelor from San Francisco interned at the Topaz War Relocation Center. The collection of Onuma's photographs and personal belongings is held by the GLBT Historical Society in San Francisco. The 2014 documentary, The Legacy of Heart Mountain, explores the experience of life at the Heart Mountain internment camp in Cody, Wyoming. The 2014 documentary film, To Be Takei chronicles the early life of actor George Takei, who spent several years in an internment camp. The 2014 feature film, Under the Blood Red Sun by Japanese-American director Tim Savage and based on Graham Salisbury's novel of the same name, examines the life of a 13-year-old Japanese-American boy living in Hawaii whose father is interned after the Japanese bomb Pearl Harbor. The 2015 documentary film Relocation, Arkansas by Vivienne Schiffer which explores the aftermath of incarceration in the Rohwer and Jerome internment camps in Arkansas. The 2005 song Kenji by Fort Minor tells the story of Mike Shinoda's grandfather, and his experience in the camps. Jake Shimabukuro's 2011 solo album Peace Love Ukulele includes a song titled Go For Broke inspired by the World War II all-Japanese American 442nd US Army unit. George Carlin, during his monologues on individual rights and criticism towards the American government, spoke about the relocation of Japanese American citizens to the designated camps. The musical Allegiance (2013), which premiered in San Diego, California, was inspired by the camp experiences of George Takei (who stars). Nina Akamu, a Sansei, created the sculpture entitled Golden Cranes of two red-crowned cranes, which became the center feature of the Japanese American Memorial to Patriotism During World War II. The U.S. Department of Defense described the November 9, 2000, dedication of the Memorial: "Drizzling rain was mixed with tears streaming down the faces of Japanese American World War II heroes and those who spent the war years imprisoned in isolated internment camps". Akamu's family connection of her grandfather on her mother's side who was interned and later died in a internment camp in Hawaii—combined with growing up for a time in Hawaii, where she fished with her father at Pearl Harbor—and the erection of a Japanese American war memorial near her home in Massa, Italy, inspired a strong connection to the Memorial and its creation. United States Attorney General Janet Reno also spoke at the dedication of the Memorial, where she shared a letter from President Clinton stating: "We are diminished when any American is targeted unfairly because of his or her heritage. This Memorial and the internment sites are powerful reminders that stereotyping, discrimination, hatred and racism have no place in this country." ...is symbolic not only of the Japanese American experience, but of the extrication of anyone from deeply painful and restrictive circumstances. It reminds us of the battles we've fought to overcome our ignorance and prejudice and the meaning of an integrated culture, once pained and torn, now healed and unified. Finally, the monument presents the Japanese American experience as a symbol for all peoples. The Smithsonian Institution's National Museum of American History has more than 800 artifacts from its A More Perfect Union collection available online. Archival photography, publications, original manuscripts, artworks, and handmade objects comprise the collection of items related to the Japanese American experience. On October 1, 1987, the Smithsonian Institution National Museum of American History opened an exhibition called, "A More Perfect Union: Japanese Americans and the U.S. Constitution". The exhibition examined the Constitutional process by considering the experiences of Americans of Japanese ancestry before, during, and after World War II. On view were more than 1,000 artifacts and photographs relating to the experiences of Japanese Americans during World War II. The exhibition closed on January 11, 2004. On November 8, 2011, the National Museum of American History launched an online exhibition of the same name with shared content. 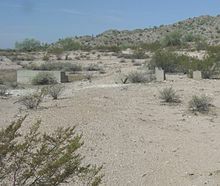 The elementary school at Poston Camp Unit 1, the only surviving school complex at one of the camps and the only major surviving element of the Poston camp, was designated a National Historic Landmark District in 2012. On April 16, 2013, the Japanese American Internment Museum was opened in McGehee, Arkansas regarding the history of two internment camps. In January 2015, the Topaz Museum opened in Delta, Utah. Its stated mission is "to preserve the Topaz site and the history of the internment experience during World War II; to interpret its impact on the internees, their families, and the citizens of Millard County; and to educate the public in order to prevent a recurrence of a similar denial of American civil rights". On June 29, 2017, in Chicago, Illinois, the Alphawood Gallery, in partnership with the Japanese American Service Committee, opened "Then They Came for Me", the largest exhibition on Japanese American incarceration and postwar resettlement ever to open in the Midwest. This exhibit was scheduled to run until November 19, 2017. Several significant legal decisions arose out of Japanese-American internment, relating to the powers of the government to detain citizens in wartime. Among the cases which reached the US Supreme Court were Ozawa v. United States (1922), Yasui v. United States (1943), Hirabayashi v. United States (1943), ex parte Endo (1944), and Korematsu v. United States (1944). In Ozawa, the court established that peoples defined as 'white' were specifically of Caucasian descent; In Yasui and Hirabayashi, the court upheld the constitutionality of curfews based on Japanese ancestry; in Korematsu, the court upheld the constitutionality of the exclusion order. In Endo, the court accepted a petition for a writ of habeas corpus and ruled that the WRA had no authority to subject a loyal citizen to its procedures. Korematsu's and Hirabayashi's convictions were vacated in a series of coram nobis cases in the early 1980s. In the coram nobis cases, federal district and appellate courts ruled that newly uncovered evidence revealed an unfairness which, had it been known at the time, would likely have changed the Supreme Court's decisions in the Yasui, Hirabayashi, and Korematsu cases. These new court decisions rested on a series of documents recovered from the National Archives showing that the government had altered, suppressed, and withheld important and relevant information from the Supreme Court, including the Final Report by General DeWitt justifying the internment program. The Army had destroyed documents in an effort to hide alterations that had been made to the report to reduce their racist content. The coram nobis cases vacated the convictions of Korematsu and Hirabayashi (Yasui died before his case was heard, rendering it moot), and are regarded as part of the impetus to gain passage of the Civil Liberties Act of 1988. The rulings of the US Supreme Court in the Korematsu and Hirabayashi cases, were criticised in Dictum in the majority opinion of Trump v. Hawaii upholding a ban on immigration of nationals from several Muslim majority countries but not overruled as it fell outside the case-law applicable to the lawsuit. The truth is—as this deplorable experience proves—that constitutions and laws are not sufficient of themselves...Despite the unequivocal language of the Constitution of the United States that the writ of habeas corpus shall not be suspended, and despite the Fifth Amendment's command that no person shall be deprived of life, liberty or property without due process of law, both of these constitutional safeguards were denied by military action under Executive Order 9066. ^ Burton, J.; Farrell, M.; Lord, F.; Lord, R. "Confinement and Ethnicity (Chapter 3)". www.nps.gov. National Park Service. Retrieved November 30, 2016. ^ "Japanese American Internment » Tule Lake". njahs.org. National Japanese American Historical Society. Retrieved November 30, 2016. ^ Weik, Taylor (March 16, 2016). "Behind Barbed Wire: Remembering America's Largest Internment Camp". NBC News. Retrieved November 30, 2016. ^ National Park Service (2012). Wyatt, Barbara (ed.). "Japanese Americans in World War II: National historic landmarks theme study" (PDF). Washington, DC: U.S. Department of the Interior. Retrieved February 22, 2017. ^ a b c Various primary and secondary sources list counts between persons. ^ Semiannual Report of the War Relocation Authority, for the period January 1 to June 30, 1946, not dated. Papers of Dillon S. Myer. Scanned image at trumanlibrary.org. Retrieved September 18, 2006. ^ "The War Relocation Authority and The Incarceration of Japanese Americans During World War II: 1948 Chronology," Web page at www.trumanlibrary.org. Retrieved September 11, 2006. ^ a b Ogawa, Dennis M. and Fox, Jr., Evarts C. Japanese Americans, from Relocation to Redress. 1991, p. 135. ^ Commission on Wartime Relocation of Civilians (1997). Personal Justice Denied. Washington, D.C.: Civil Liberties Public Education Fund. p. 459. ^ "WWII Propaganda: The Influence of Racism – Artifacts Journal - University of Missouri". artifactsjournal.missouri.edu. ^ a b "Short History of Amache Japanese Internment". Archived from the original on October 4, 2008. Retrieved April 21, 2008. ^ a b Removal process, A More Perfect Union: Japanese Americans and the U.S. Constitution, Smithsonian Institution. ^ "Executive Order 9066 dated February 19, 1942, in which President Franklin D. Roosevelt Authorizes the Secretary of War to Prescribe Military Areas". National Archives Catalog. National Archives and Records Administration. February 19, 1942. Retrieved December 15, 2015. ^ a b c d e Korematsu v. United States dissent by Justice Owen Josephus Roberts, reproduced at findlaw.com. Retrieved September 12, 2006. ^ a b Brian Niiya. "Voluntary evacuation," Densho Encyclopedia. Retrieved March 12, 2014. ^ a b c Densho, "About the Incarceration." ^ JR Minkel (March 30, 2007). "Confirmed: The U.S. Census Bureau Gave Up Names of Japanese-Americans in WW II". Scientific American. ^ Hakim, Joy (1995). A History of Us: War, Peace and All That Jazz. New York: Oxford University Press. pp. 100–04. ISBN 0-19-509514-6. ^ a b Sharon Yamato. "Civil Liberties Act of 1988," Densho Encyclopedia. Retrieved March 11, 2014. ^ 100th Congress, S. 1009, reproduced at, internmentarchives.com. Retrieved September 19, 2006. ^ "Wwii Reparations: Japanese-American Internees". Democracy Now!. Retrieved January 24, 2010. ^ a b Anderson, Emily. "Immigration," Densho Encyclopedia. Retrieved August 14, 2014. ^ a b Nakamura, Kelli Y. "," Densho Encyclopedia. Retrieved August 14, 2014. ^ Anderson, Emily. "Anti-Japanese exclusion movement," Densho Encyclopedia. Retrieved August 14, 2014. ^ Ng, Wendy (2002). Japanese American Internment during World War II: A History and Reference Guide. Westport, CT: Greenwood. pp. 8–9. ^ Kashima, Tetsuden. "Custodial detention / A-B-C list," Densho Encyclopedia. Retrieved August 14, 2014. ^ Weglyn, Michi Nishiura. Years of Infamy (New York: William Morrow & Company, 1976) p34. ^ Niiya, Brian. "Kenneth Ringle," Densho Encyclopedia. Retrieved August 14, 2014. ^ Irons, Peter. (1993). Justice At War: The Story of the Japanese American Internment Cases. University of Washington Press. pp. 7–9. ^ Prange, Gordon W (1962). December 7, 1941: The Day the Japanese Attacked Pearl Harbor. New York: McGraw Hill. pp. 375–77. ^ a b c Conn, Stetson; Engelman, Rose C.; Fairchild, Byron (2000) . Guarding the United States and its Outposts. 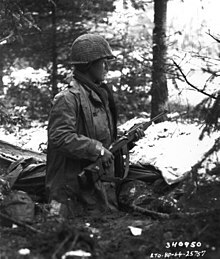 United States Army in World War II. Washington, D.C.: Center of Military History, United States Army. p. 120–23. ^ Niiya, Brian. "," Densho Encyclopedia. Retrieved August 14, 2018. ^ Fred Mullen, "DeWitt Attitude on Japs Upsets Plans," Watsonville Register-Pajaronian, April 16, 1943. p.1, reproduced by Santa Cruz Public Library. Retrieved September 11, 2006. ^ Testimony of John L. DeWitt, April 13, 1943, House Naval Affairs Subcommittee to Investigate Congested Areas, Part 3, pp. 739–40 (78th Cong ., 1st Sess. ), cited in Korematsu v. United States (Murphy, J., dissenting), footnote 2, reproduced at findlaw.com. Retrieved September 11, 2006. ^ a b c d e f g h i j k Andrew E. Taslitz, "Stories of Fourth Amendment Disrespect: From Elian to the Internment," 70 Fordham Law Review. 2257, 2306–07 (2002). ^ "Brief Overview of the World War II Enemy Alien Control Program". Retrieved December 6, 2012. ^ "Roosevelt ushers in Japanese-American internment – Jan 14, 1942". History.com. ^ WWII Enemy Alien Control Overview Archived September 13, 2016, at the Wayback Machine from archives.gov Retrieved January 8, 2007. ^ Niiya, Brian. "Public Law 503". Densho Encyclopedia. Retrieved August 20, 2014. ^ a b c d Hirabayashi v. United States, reproduced at findlaw.com. Retrieved September 15, 2006. ^ Kennedy, Ellen Clare (October 2006). "The Japanese-American Renunciants: Due Process and the Danger of Making Laws During Times of Fear". Japan Policy Research Institute. Retrieved March 3, 2011. ^ Kublin, Hyman. Comparative Studies in Society and History. 1st ed. Vol. 2. Cambridge: Cambridge University Press. pp. 67–84. ^ Korematsu v. United States dissent by Justice Frank Murphy, footnote 12, reproduced at findlaw.com. Retrieved September 11, 2006. ^ Takaki, Ronald T. "A Different Mirror: A History of Multicultural America". Boston: Little, Brown. 1993. Print, p. 378. ^ a b c d Takaki, Ronald T. "A Different Mirror: A History of Multicultural America". Boston: Little, Brown 1993. Print, p. 379. ^ Hoiles, R.C. (October 14, 1942). "In his own words: R.C. Hoiles on the WWII Japanese internment". The Orange County Register. Retrieved February 23, 2016. ^ Hallstead, William (November 12, 2000). "HistoryNet". The Niihau Incident. HistoryNet. Retrieved February 17, 2015. ^ Irons, Peter. (1993). Justice At War: The Story of the Japanese American Internment Cases. University of Washington Press. pp. 374–5. ^ Malkin, Michelle. In Defense of Internment. 2004, pp. 128, 135, 275. ^ Malkin, Michelle (August 3, 2004). "In Defense Of Internment". Michelle Malkin. Retrieved December 5, 2011. ^ Eric Muller. "So Let Me Get This Straight: Michelle Malkin Claims to Have Rewritten the History of Japanese Internment in Just 16 Months?". History Network. Retrieved December 5, 2011. ^ "Why the Media Should Stop Paying Attention to the New Book that Defends Japanese Internment". hnn.us. ^ Khawaja, Irfan. 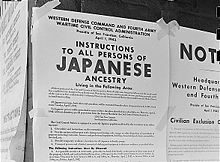 "Japanese Internment: Why Daniel Pipes Is Wrong". Hnn.us. Retrieved January 24, 2010. ^ Daniel Pipes. "Japanese Internment: Why It Was a Good Idea – And the Lessons It Offers Today". Hnn.us. Retrieved December 5, 2011. ^ Lt. Gen. J.L. DeWitt (June 5, 1943). "Final Report; Japanese Evacuation from the West Coast 1942". U.S. Army. Retrieved March 3, 2011. ^ Brian, Niiya (February 1, 2014). Final Report, Japanese Evacuation from the West Coast, 1942. Densho Encyclopedia. ^ "Final Report, Japanese Evacuation from the West Coast, 1942 (book)". encyclopedia.densho.org. Densho Encyclopedia. ^ "Bad landmark; righting a racial wrong". Time Magazine. November 21, 1983. Retrieved March 3, 2011. ^ "Action on Japs". Los Angeles Times. February 19, 1942. p. A4. ^ "Time To Get Tough". The Atlanta Constitution. February 20, 1942. p. 8. ^ "Military Necessity". Washington Post. February 22, 1942. p. B6. ^ "Dies Confirms Need for Removal of Japs". Los Angeles Times. February 28, 1942. p. A4. ^ "Kindness to Alien Japs Proves Poor Policy". Los Angeles Times. December 8, 1942. p. A4. ^ "Stupid and Dangerous". Los Angeles Times. April 22, 1943. p. A4. ^ "Photograph of Members of the Mochida Family Awaiting Evacuation". National Archives. Archived from the original on September 5, 2017. Retrieved September 4, 2017. ^ a b Densho, "Sites of Shame." ^ a b Alan Rosenfeld. "German and Italian detainees", Densho Encyclopedia (accessed March 5, 2014). ^ a b c d Niiya, Brian. Japanese American History: An A to Z History from 1868 to the Present (1993) p191. ^ a b c Brian Niiya. "Wartime Civil Control Administration," Densho Encyclopedia (accessed March 14, 2014). ^ American Concentration Camps, Roger Daniels, Vol. 4 April, 1942, Garland Publishing, New York, 1989. ^ Confinement and Ethnicity: An Overview of World War II Japanese American Relocation Sites, Jeffery F. Burton, Mary M. Farrell, Florence B. Lord, and Richard W. Lord, Chapter 16, NPS. Retrieved August 31, 2006. ^ a b c d Konrad Linke. "Assembly centers," Densho Encyclopedia (accessed March 14, 2014). ^ Confinement and Ethnicity: An Overview of World War II Japanese American Relocation Sites, Jeffery F. Burton, Mary M. Farrell, Florence B. Lord, and Richard W. Lord, Chapter 3, NPS. Retrieved August 31, 2006. ^ "Japanese Relocation Archived from the original (FILM- original film viewable for free) on 16 July 2002. Retrieved". The Internet Archive. U.S. Office of War Information. 1943. Retrieved November 17, 2017. Neither the Army, not the War Relocation Authority relish the idea of taking men, women and children from their homes, their shops and their farms. So, the military and civilian agencies alike, determined to do the job as a democracy should—with real consideration for the people involved. ^ Japanese Americans From Relocation to Redress. Daniels, Roger, Sandra Taylor, Harry Kitano. Seattle Washington. University of Washington Press, 1991. ^ a b c d "Japanese American Internment Camps". Retrieved October 2, 2007. ^ a b "Alien Enemy Detention Facility, Crystal City, Texas". The Texas Archive of the Moving Image. Retrieved August 5, 2011. ^ Burton, J.; Farrell, M.; Lord, F.; Lord, R. Confinement and Ethnicity: An Overview of World War II Japanese American Relocation Sites, "Temporary Detention Stations Archived November 6, 2014, at the Wayback Machine" (National Park Service, 2000). Retrieved August 13, 2014. ^ Tawa, Renee. Childhood Lost: The Orphans of Manzanar", Los Angeles Times, March 11, 1997 (accessed May 23, 2014). ^ "Docket No. 236-A, 236-B, Gila River Indian Community v. The United States of America" (PDF). Indian Claims Commission Decisions. 25: 250. April 28, 1971. ^ a b Japanese American National Museum, "Chronology of WWII Incarceration" (accessed March 12, 2014). ^ Brian Niiya. "Military Areas 1 and 2," Densho Encyclopedia Retrieved March 12, 2014. ^ Kashima, T. (2003). Judgment without trial: Japanese American imprisonment during World War II. University of Washington Press. ^ Anne Blankenship. "Bainbridge Island, Washington," Densho Encyclopedia (accessed March 31, 2014). ^ "The Colorado History Organization". Web.archive.org. Archived from the original on October 2, 2006. Retrieved January 24, 2010. ^ Brian Niiya. "Civilian exclusion orders," Densho Encyclopedia (accessed March 31, 2014). ^ "FDR-51: Letter, Harold L. Ickes to FDR, and Letter, FDR to Harold L. Ickes re: Conditions in Japanese-American Internment Camps, April 13 & 24, 1943 OF 4849: War Relocation Authority, 1943 (Box 1)" (PDF). Franklin D. Roosevelt Presidential Library and Museum. April 13, 1943. Retrieved December 11, 2015. ^ a b c Sandler, Martin. Imprisoned: The Betrayal of Japanese Americans during World War II. New York: Walker of Bloomsbury, 2013. ^ Myer, Dillon S. (March 1943). Work of the War Relocation Authority, An Anniversary Statement. The Harry S. Truman Library & Museum. ^ Hane, Mikiso (September 1990). Wartime Internment. Organizer of American Historians. ^ Sleeper, Lu Ann (2013). Interview of Nancy Ikeda Baldwin (PDF). Regional Oral History Office, Bancroft Library. ^ a b c Fiset, Louis. "Medical care in camp". Densho Encyclopedia. Retrieved November 3, 2014. ^ James, Thomas (October 1, 2013). Exile within: The Schooling of Japanese Americans, 1942–1945. Harvard University Press. ISBN 978-0674184725. ^ "Children of the Camps". PBS.org. Retrieved February 10, 2015. ^ a b c Foster, Karen (September 11, 2015). "Teaching Literacy Behind Barbed Wire in WWII: Elementary Schools in Japanese-American Internment Camps in Arkansas". Childhood Education. 91: 378–87. ^ Bearden, R (1989). "Life inside Arkansas' Japanese-American relocation centers". Arkansas Historical Quarterly. XLVIII: 169–96 – via Google Scholar. ^ Bearden, R (1989). "Life inside Arkansas' Japanese-American relocation centers". Arkansas Historical Quarterly. XLVIII: 189. ^ Wu, Hui. "Writing and Teaching behind Barbed Wire: An Exiled Composition Class in a Japanese-American Internment." 59 College Composition & Communication (Dec 2007): 327–262. ^ "Japanese Americans at Manzanar". National Park Service. United States. Retrieved February 10, 2015. ^ Michael, Beschloss (June 20, 2014). "For Incarcerated Japanese-Americans, Baseball Was 'Wearing the American Flag'". New York Times. NY Times. Retrieved February 10, 2015. ^ a b Rafferty-Osaki, Terumi (2015). "Sports and recreation in camp". Densho Encyclopedia. Retrieved February 10, 2015. ^ a b c Austin, Allan W. "National Japanese American Student Relocation Council". Densho Encyclopedia. Retrieved August 18, 2014. ^ "Oberlin vouches for them ..." Oberlin Alumni Magazine (Winter). 2013. pp. 12–17. Retrieved August 18, 2014. ^ a b Cherstin M. Lyon. "Loyalty questionnaire," Densho Encyclopedia (accessed March 14, 2014). ^ a b Cherstin M. Lyon. "Segregation," Densho Encyclopedia (accessed March 14, 2014). ^ a b c "Tule Lake Committee - tulelake.org". tulelake.org. Archived from the original on February 27, 2010. Retrieved January 24, 2010. ^ Malkin, Michelle. In Defense of Internment. 2004, p. 111. ^ Christgau, John (February 1985). "Collins versus the World: The Fight to Restore Citizenship to Japanese American Renunciants of World War II". Pacific Historical Review. University of California Press. 54 (1): 1–31. doi:10.2307/3638863. JSTOR 3638863. ^ a b "Japanese American women in World World II". ^ "President Clinton Approves Medal of Honor for Asian Pacific American World War II Heroes". US Army. May 12, 2000. Archived from the original on November 4, 2007. Retrieved October 20, 2008. ^ "Central Europe Campaign – (522nd Field Artillery Battalion)". Go For Broke National Education Center. Archived from the original on November 25, 2009. ^ "Central Europe Campaign – 522nd Field Artillery Battalion". Retrieved January 12, 2015. In fact, the brutal death marches south had already begun on April 24. Jewish prisoners from the outer Dachau camps were marched to Dachau, and then 70 miles south. Many of the Jewish marchers weighed less than 80 pounds. Shivering in their tattered striped uniforms, the "skeletons" marched 10 to 15 hours a day, passing more than a dozen Bavarian towns. If they stopped or fell behind, the SS guards shot them and left their corpses along the road. Thousands died from exposure, exhaustion, and starvation. On May 2, the death march was outside Waakirchen, Germany, near the Austrian border, when the 522nd came across the marchers. That day, soldiers from the 522nd were patrolling near Waakirchen. The Nisei saw an open field with several hundred "lumps in the snow". When the soldiers looked closer they realized the "lumps" were people. Some were shot. Some were dead from exposure. Hundreds were alive. But barely. The 522nd discovered hundreds of prisoners with black and white prison garb, shaven heads, sunken eyes, and hollowed cheeks. Some roamed aimlessly around the countryside. Some were too weak to move. All were severely malnourished. One soldier gave a starving Jewish prisoner a candy bar, but his system couldn't handle solid food. Then the Americans were told not to give food to the prisoners because it could do them more harm than good. For the next three days, the Nisei helped the prisoners to shelter and tended to their needs as best as they could. They carried the survivors into warm houses and barns. The soldiers gave them blankets, water and tiny bits of food to ease them back from starvation. The soldiers left Waakirchen on May 4, still deeply disturbed by the harrowing scenes of the Jewish prisoners. ^ Takaki, Ronald T. "A Different Mirror: A History of Multicultural America". Boston: Little, Brown. 1993. Print, p. 384. ^ Takaki, Ronald T. "A Different Mirror: A History of Multicultural America". Boston: Little, Brown 1993. Print, p. 385. ^ Moore, Brenda L. (2003). Serving Our Country: Japanese American Women in the Military during World War II. New Brunswick, NJ: Rutgers University Press. ISBN 978-0813532783. ^ Ito, Satoshi Interview. 01.MP3, "Ito Interview Interview Part 1", , time 11:35. ^ Ito, Satoshi Interview. 01.MP3, "Ito Interview Interview Part 1", , time 10:36. ^ a b c Densho, The Board of Trustees of the Leland Stanford Junior University. "Japanese Latin Americans," c. 2003, accessed April 12, 2009. ^ a b Agence France-Presse/Jiji Press, "Peru sorry for WWII internments", Japan Times, June 16, 2011, p. 2. ^ "The territorial governor of Hawaii, Joseph B. Poindexter, was more measured. He provided statistics indicating that 34 percent of the islands' population was aliens, or citizens of Japanese descent." Frank, Richard B. "Zero Hour on Niihau," World War II, 24: 2 (July 2009) p54. ^ "Japanese Internment Camps In Hawaii" (PDF). Retrieved December 5, 2011. ^ Jane L. Scheiber, Harry N. Scheiber. "Martial law in Hawaii," Densho Encyclopedia. Retrieved July 15, 2014. ^ Okihiro, Gary. Cane Fires: The Anti-Japanese Movement in Hawaii, 1865–1945. Temple University Press, 1st edition (January 8, 1992) p117. ^ Chin, Aimee. "Long-Run Labor Market Effects of Japanese American Internment During World War II on Working-Age Male Internees," Journal of Labor Economics, University of Houston (2004) p10. ^ Stetson Conn; Rose C. Engelman; Byron Fairchild (May 1961). "Guarding the United States and Its Outposts". United States Army in World War II. United States Army Center of Military History. Retrieved November 7, 2011. ^ Dye, Bob (September 16, 2001). "How bigots 'cleansed' Legislature in 1942". The Honolulu Advertiser. Retrieved December 23, 2009. ^ Gordon, Mike (November 27, 2005). "Wartime stain in history retraced in O'ahu's brush". The Honolulu Advertiser. Retrieved December 10, 2009. ^ Gordon, Mike (February 5, 2006). "Under Honouliuli brush, dark history". The Honolulu Advertiser. Retrieved December 10, 2009. ^ Greg Mebel, Anthony Pignataro (August 20, 2007). "The Camp". Maui time. Archived from the original on September 20, 2012. Retrieved April 4, 2011. ^ Star-Bulletin, Honolulu. "Hawaii News Archive - Starbulletin.com". archives.starbulletin.com. ^ Robinson, Greg. (2001). By Order of the President:FDR and the Internment of Japanese Americans, p. 264n2 citing C. Harvey Gardiner, Pawns in a Triangle of Hate (Seattle: University of Washington Press, 1981). ^ Nanami, Masaharu (Kyodo News), "Japanese-Peruvians still angry over wartime internment in U.S. camps," Japan Times, September 16, 2009. ^ a b c d Stephen Mak. "Japanese Latin Americans," Densho Encyclopedia (accessed March 5, 2014). ^ a b C. Harvey Gardiner. Pawns in a Triangle of Hate: The Peruvian Japanese and the United States (University of Washington Press: Seattle, 1981), 25–29. ^ "Department of Justice and U.S. Army Facilities", U.S. National Park Service. Retrieved August 31, 2006. ^ Correspondence, Secretary of State to President Roosevelt, 740.00115 European War 1939/4476, PS/THH, August 27, 1942. ^ "Japanese Americans, the Civil Rights Movement and Beyond" (PDF). Retrieved April 10, 2009. ^ Higashide, Seiichi. (2000).Adios to Tears, p. 179. ^ Niiya, Brian. "Franklin D. Roosevelt". Densho Encyclopedia. Retrieved January 27, 2015. ^ Nagasawa, Katherine (August 13, 2017). "What happened to Chicago's Japanese neighborhood?". WBEZ. Retrieved August 14, 2017. 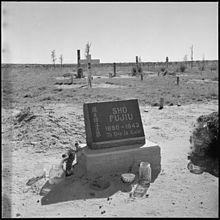 ^ "PBS Investigations of the Tule Lake Camp. Retrieved August 24, 2007". ^ Tule Lake Committee, "History." Retrieved January 27, 2015. ^ Robinson, Greg. "War Relocation Authority". Densho Encyclopedia. Retrieved January 27, 2015. 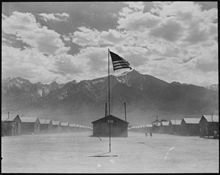 ^ "Japanese Americans Internment Camps During World War II," Library web page at Utah.edu. Retrieved October 1, 2006. ^ Connell, Thomas (2002). America's Japanese Hostages: The World War II Plan for a Japanese Free Latin America. Greenwood Publishing Group. p. 223. ISBN 0-275-97535-5. ^ "Enemy Alien Curfew Friday: German, Japs, Italians in New Restrictions" (March 24, 1942), The San Francisco News. Retrieved February 5, 2015. ^ Long, Priscilla. 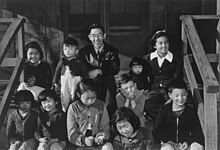 "Seattle School Board accepts the forced resignation of Japanese American teachers on February 27, 1942" (November 25, 2001), HistoryLink.org. Retrieved February 5, 2015. ^ Hall, Carla. "Japanese Fired in WWII Win Redress" (February 28, 1998), Los Angeles Times. Retrieved February 5, 2015. ^ Hirai, Tomo. "State Legislature passes resolution apologizing to fired employees" (September 5, 2013) Nichi Bei Weekly. Retrieved February 5, 2015. ^ Kashima, Tetsuden. "Homicide in Camp," Densho Encyclopedia. Retrieved February 5, 2015. ^ "The WRA says Thirty," New Republic 112, pp. 867–68. ^ Niiya, Brian (1993). Japanese American history : an A-to-Z reference from 1868 to the present. New York: Facts On File. p. 143. ISBN 0-8160-2680-7. ^ Niiya, Brian. "Terrorist incidents against West Coast returnees," Densho Encyclopedia. Retrieved February 5, 2015. ^ a b "The Causal Effect of Place: Evidence from Japanese-American Internment". Retrieved August 8, 2016. ^ "Personal Justice Denied". Nps.gov. January 8, 2007. Retrieved April 1, 2015. ^ Barth, Gunther. "Japanese Americans." The New Encyclopedia of the American West, edited by Howard R. Lamar, Yale University Press, 1st edition, 1998. Credo Reference, http://search.credoreference.com/content/entry/americanwest/japanese_americans/0 Accessed 29 Mar 2017. ^ Brooks, Roy L. "Japanese American Internment and Relocation." Encyclopedia of Race and Racism, edited by Patrick L. Mason, Gale, 2nd edition, 2013. Credo Reference, http://search.credoreference.com/content/entry/galerace/japanese_american_internment_and_relocation/0 Accessed 29 Mar 2017. ^ Kashima, Tetsuden. "Internment Camps." Encyclopedia of American Studies, edited by Simon Bronner, Johns Hopkins University Press, 1st edition, 2016. Credo Reference, http://search.credoreference.com/content/entry/jhueas/internment_camps/0 Accessed 29 Mar 2017. ^ Liu, Ling Woo (January 29, 2011). 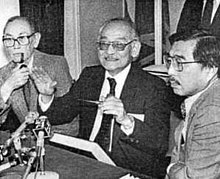 "California Marks the First Fred Korematsu Day". Time. Retrieved January 31, 2011. ^ "The Manzanar Controversy". Public Broadcasting System. Retrieved July 18, 2007. ^ Daniels, Roger (May 2002). "Incarceration of the Japanese Americans: A Sixty-Year Perspective". The History Teacher. 35 (3): 4–6. doi:10.2307/3054440. JSTOR 3054440. Archived from the original on December 29, 2002. Retrieved July 18, 2007. ^ Ito, Robert (September 15, 1998). "Concentration Camp Or Summer Camp?". Mother Jones. Retrieved November 18, 2010. ^ "Densho: Terminology & Glossary: A Note On Terminology". Densho. 1997. Archived from the original on June 24, 2007. Retrieved July 15, 2007. ^ Reflections: Three Self-Guided Tours Of Manzanar. Manzanar Committee. 1998. pp. iii–iv. ^ "CLPEF Resolution Regarding Terminology". Civil Liberties Public Education Fund. 1996. Retrieved July 20, 2007. ^ Embrey, Bruce (October 21, 2010). "Sue Kunitomi Embrey: Concentration Camps, Not Relocation Centers". Manzanar Committee. Retrieved May 11, 2017. ^ Herzig Yoshinaga, Aiko (March 4, 2010). "Words Can Lie Or Clarify Criticizes Euphemistic Language Used To Describe WWII Camps Used To Imprison Japanese Americans". Aiko Herzig Yoshinaga (self-published). Retrieved May 14, 2018. ^ Sengupta, Somini (March 8, 1998). "What Is a Concentration Camp? Ellis Island Exhibit Prompts a Debate". New York Times. Retrieved July 11, 2011. ^ McCarthy, Sheryl (July – August 1999). "Suffering Isn't One Group's Exclusive Privilege". HumanQuest. ^ "American Jewish Committee, Japanese American National Museum Issue Joint Statement About Ellis Island Exhibit Set To Open April 3" (Press release). Japanese American National Museum and American Jewish Committee. March 13, 1998. Retrieved December 30, 2007. ^ Sengupta, Somini (March 10, 1998). "Accord On Term "Concentration Camp"". New York Times. Retrieved June 13, 2010. ^ "Words for Suffering". New York Times. March 10, 1998. Retrieved December 31, 2007. ^ Haberman, Clyde (March 13, 1998). "NYC; Defending Jews' Lexicon Of Anguish". New York Times. Retrieved July 11, 2011. ^ Harris, David A (March 13, 1998). "Exhibition on Camps". New York Times. Retrieved July 11, 2011. ^ Noguchi, Andy (July 16, 2012). "JACL Ratifies Power Of Words Handbook: What Are The Next Steps?". Japanese American Citizens League via the Manzanar Committee. Retrieved May 20, 2017. ^ Michael Rywkin (1994). "Moscow's lost empire". M.E. Sharpe. p. 66. ISBN 1-56324-237-0. ^ Yamamoto, J.K. (December 11, 2013). "Five-0 Flashes Back to WWII". Rafu Shimpo. Retrieved March 15, 2015. ^ "University of Washington Press – Books – No-No Boy". www.washington.edu. ^ "Random House for High School Teachers - Catalog - Snow Falling on Cedars by David Guterson". www.randomhouse.com. ^ "Snow Falling on Cedars". January 7, 2000 – via www.imdb.com. ^ "When the Emperor Was Divine". www.julieotsuka.com. ^ Ford, Jamie (January 27, 2009). "Hotel on the Corner of Bitter and Sweet: A Novel". Random House Publishing Group – via Google Books. ^ "Julie Otsuka :: author of The Buddha In The Attic and When The Emperor Was Divine". www.julieotsuka.com. Retrieved March 29, 2017. ^ "Book Review: Camp Nine by Vivienne Schiffer". ^ "Kermit Roosevelt Professor of Constitutional Law at the University of Pennsylvania Law School & Award-Winning Author Read, watch & learn about today's politics, the US Supreme Court, law and justice, ethics and American ideals, and gain a better understanding of the historical context. Peruse the bookshelf for works of fiction and nonfiction". Kermit Roosevelt. ^ "The Karate Kid". June 22, 1984 – via www.imdb.com. ^ "Come See the Paradise". January 1, 1991 – via www.imdb.com. ^ Takemoto, Tina (2014). "Looking for Jiro Onuma: A Queer Meditation on the Incarceration of Japanese Americans during World War II". GLQ. 20: 241–75. ^ "Heart Mountain Documentary Film – The Legacy of Heart Mountain". www.heartmountainfilm.com. ^ "George Takei". August 25, 2015. Archived from the original on August 25, 2015. ^ "To Be Takei: Sundance Review"
^ "Under the Blood Red Sun: IMDB"
^ "Relocation, Arkansas: Aftermath of Incarceration". October 1, 2016 – via www.imdb.com. ^ "Allegiance". Allegiance Musical. Allegiance Musical. Archived from the original on February 21, 2015. Retrieved February 23, 2015. ^ Cite error: The named reference Goode was invoked but never defined (see the help page). ^ Cite error: The named reference NJAM was invoked but never defined (see the help page). ^ "A More Perfect Union Collection Search". National Museum of American History, Smithsonian Institution. Retrieved April 24, 2012. ^ "A More Perfect Union Online Exhibition". National Museum of American History, Smithsonian Institution. Retrieved April 24, 2012. ^ "NHL nomination for Poston Elementary School, Unit 1, Colorado River Relocation Center" (PDF). National Park Service. Retrieved December 7, 2015. ^ "Significant Milestones of the Topaz Museum". Retrieved July 11, 2016. ^ "Topaz Museum Mission Statement". Retrieved July 11, 2016. ^ "Then They Came For Me". Alphawood Gallery. Retrieved July 7, 2017. ^ a b c Irons, Peter. (1996) . Justice At War: The Story of the Japanese American Internment Cases. University of Washington Press. ISBN 0-520-08312-1. ^ "Supreme Court finally condemns 1944 decision that allowed Japanese internment during World War II". Vox. Retrieved September 22, 2018. ^ Conrat, Maisie and Conrat, Richard. Executive Order 9066: The Internment of 110,000 Japanese Americans. ^ "Asian American Books.com, quote from back cover". Asianamericanbooks.com. Retrieved January 24, 2010. Connell, Thomas. (2002). America's Japanese Hostages: The US Plan For A Japanese Free Hemisphere. Westport: Praeger-Greenwood. ISBN 978-0275975357. Conn, Stetson (2000) . "5. The Decision to Evacuate the Japanese from the Pacific Coast". In Kent Roberts Greenfield (ed.). Command Decisions. United States Army Center of Military History. CMH Pub 70-7. Conn, Stetson; Engelman, Rose C.; Fairchild, Byron (2000) . Guarding the United States and its Outposts. United States Army in World War II. Washington, D.C.: Center of Military History, United States Army. pp. 115–49. Drinnon, Richard. Keeper of Concentration Camps: Dillon S. Meyer and American Racism. Berkeley: University of California Press, 1989. Elleman, Bruce (2006). Japanese-American civilian prisoner exchanges and detention camps, 1941–45. Routledge. p. 179. ISBN 978-0-415-33188-3. Retrieved September 14, 2009. Gordon, Linda and Gary Y. Okihiro (eds. ), Impounded: Dorothea Lange and the Censored Images of Japanese American Internment. New York: W.W. Norton, 2006. Harth, Erica. (2001). Last Witnesses: Reflections on the Wartime Internment of Japanese Americans. Palgrave, New York. ISBN 0-312-22199-1. Hirabayashi, Lane Ryo. The Politics of Fieldwork: Research in an American Concentration Camp. Tucson: The University of Arizona Press, 1999. Lyon, Cherstin M. Prisons and Patriots: Japanese American Wartime Citizenship, Civil Disobedience, and Historical Memory. Philadelphia: Temple University Press, 2012. Mackey, Mackey, ed. Remembering Heart Mountain: Essays on Japanese American Internment in Wyoming. Wyoming: Western History Publications, 1998. Miyakawa, Edward T. Tule Lake. Trafford Publishing, 2006. Robinson, Greg. By Order of the President: FDR and the Internment of Japanese Americans. Cambridge and others: Harvard University Press, 2001. Robinson, Greg (2009). A Tragedy of Democracy: Japanese Confinement in North America. Columbia University Press. ISBN 978-0-231-12922-0. Sato, Kiyo, Kiyo's Story, A Japanese-American Family's Quest for the American Dream. New York: Soho Press, 2009. Weglyn, Michi. (1996) . Years Of Infamy: The Untold Story Of America's Concentration Camps. University of Washington Press. ISBN 0-295-97484-2. Civil Liberties Public Education Fund. (1997). Personal Justice Denied: Report of the Commission on Wartime Relocation and Internment of Civilians. Civil Liberties Public Education Fund and University of Washington Press. ISBN 0-295-97558-X. Japanese American Internment: Fear Itself – Lesson plans and photographs at U.S. Library of Congress. "Japanese Americans In World War II", National Park Service, stories, photographs and documents. "Japanese American Relocation Digital Archives", University of California, contains personal & official photographs, letters, diaries, transcribed oral histories, etc. University of Oregon Office of the Dean of Personnel Administration. National Japanese American Student Relocation Council records. Housed at the University of Oregon Libraries, the collection includes correspondence, newsletters, speeches, minutes of meetings, and ephemera. National Japanese Student Relocation Council Records housed at the Hoover Institution Library and Archives at Stanford University. National Park Service; Confinement and Ethnicity: An Overview of World War II Japanese American Relocation Sites. CSPAN program "Japanese Americans During World War II" with George Takei, moderated by Kermit Roosevelt. The National Constitution Center presents "Civil Liberties in Times of Crisis: Japanese American Internment and America Today" with Karen Korematsu and Kermit Roosevelt, moderated by [permanent dead link] Jess Bravin. Prejudice, War, and the Constitution, by Jacobus tenBroek, Edward N. Barnhart, and Floyd W. Matsen; 1954; University of California Press. A must read for anyone seeking insight to the treatment of those who should have been, but were not, protected by our Constitution.